” Given ACCHOs commitment to providing services based on community identified needs, it is not surprising, then, to learn that we are starting to address justice inequities by developing innovative partnerships with legal services. 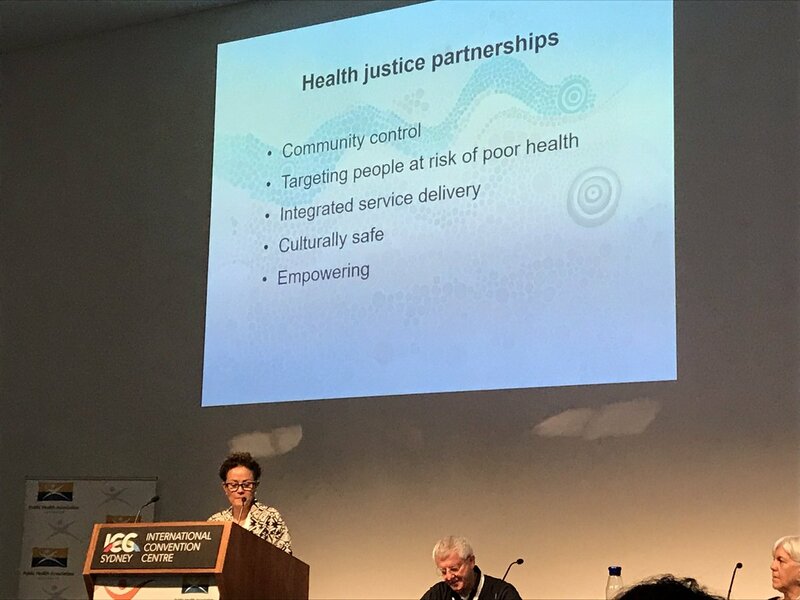 Health justice partnerships in the ACCHO context address people’s fears and distrust about the justice system, by providing a culturally safe setting in which to have conversations about legal matters. I believe that the development of collaborative, integrated service models such as Law Yarn can provide innovative and effective solutions for addressing not only the overrepresentation of Aboriginal and Torres Strait Islander peoples in the justice system, but also the health gaps between Indigenous and non-Indigenous Australians. A justice target has been proposed to focus government efforts towards closing the gap on Aboriginal and Torres Strait Islander peoples’ overrepresentation in the justice system. Discussion of the role of community leadership to address this serious issue must begin with a commitment to self-determination, community control, cultural safety and a holistic response. 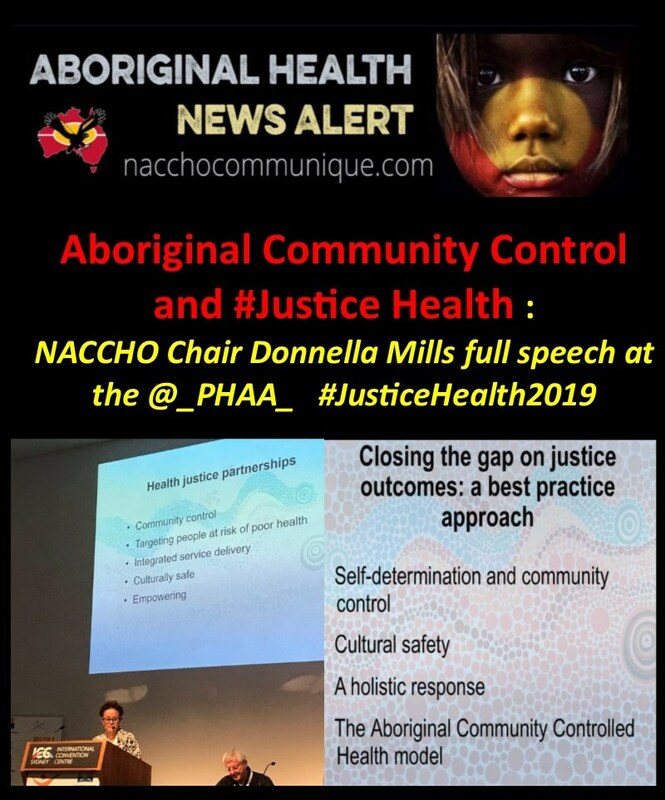 Aboriginal community controlled health services understand the interplays between intergenerational trauma, the social determinants of health, family violence, institutional racism and contact with the justice system. As trusted providers within their communities, they deliver services based on community identified needs. I would like to acknowledge that the land we meet on today is the traditional lands for the Gadigal people of the Eora Nation, and that we respect their spiritual relationship with their Country. I also acknowledge the Gadigal people as the traditional custodians of this place we now call Sydney. Their cultural and heritage beliefs are still as important to the living Gadigal people today. This is also true for all Aboriginal and Torres Strait Islander peoples that are here this morning. We draw on the strength of our lands, our Elders past and on the lived experience of our community members. For those who don’t know me, I am a proud Torres Strait Islander woman with ancestral and family links to Masig and Nagir. I thank the Public Health Association of Australia for welcoming me here so warmly. I am delighted to be here today to share ideas with you on a topic that I care so deeply about. Some of you may be aware that, late last month, a Partnership Agreement on Closing the Gap was signed between the Council of Australian Governments and the Coalition of Aboriginal and Torres Strait Islander Peak Bodies. The agreement sets out how governments and Aboriginal and Torres Strait Islander representatives will work together on targets, implementation and monitoring arrangements for the Close the Gap strategy. NACCHO and almost 40 other peak Aboriginal and Torres Strait Islander bodies negotiated the terms and conditions of this historic agreement on the understanding that when Aboriginal and Torres Strait Islander peoples are included and have a real say in the design and delivery of services that impact on them, the outcomes are far better. This understanding informs the premise of my presentation. I am here to talk to you about how the principles, values and beliefs underpinning the Aboriginal community controlled service model provide the foundations for preventing and reducing Aboriginal and Torres Strait Islander peoples’ exposure to the justice system. But first, a little bit about NACCHO, for those of you who are unfamiliar with our work. 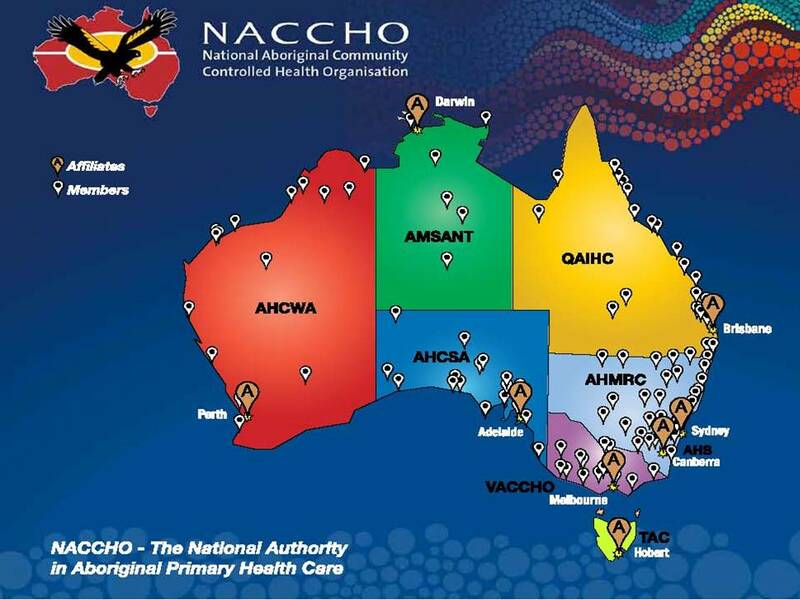 NACCHO, which stands for the National Aboriginal Community Controlled Health Organisation, is the national peak body representing 145 Aboriginal Community Controlled Health Organisations – ACCHOs – across the country, on Aboriginal health and wellbeing issues. Our members provide about three million episodes of holistic primary health care per year for about 350,000 people. In very remote areas, our services provide about one million episodes of care in a twelve-month period. Collectively, we employ about 6,000 staff (56 per cent whom are Indigenous), which makes us the single largest employer of Indigenous people in the country. It is timely to come together and consider justice health issues in Aboriginal and Torres Strait Islander communities. It is likely that, for the first time, a justice target may be included in the Close the Gap Refresh strategy. I am heartened to know that, for the first time, Aboriginal and Torres Strait Islander peak bodies will guide the finalisation of targets and oversee the strategy’s implementation, monitoring and evaluation. I am hopeful that, for the first time, we can begin to address the issues and see some improvements. All of you hear today will have read and heard the shocking statistics, the increasing rates of incarceration among Indigenous Australians. Imprisoning women affects the whole community. Children may be removed and placed in out-of-home care. Research has found there are links between detainees’ children being placed into out-of-home care and their subsequent progression into youth detention centres and adult correctional facilities. [iv] Communities suffer, and the cycle of intergenerational trauma and disadvantage is perpetuated. On an average night in the June quarter 2018, nearly 59% of young people aged 10–17 in detention were Aboriginal and Torres Strait Islander, despite Aboriginal and Torres Strait Islander young people making up only 5% of the general population aged 10–17. People living with physical disabilities such as hearing loss, and people with undiagnosed cognitive or psycho-social disabilities may struggle to negotiate the justice system and their symptoms are likely to be correlated with their offending behaviours, and receive punitive responses rather than treatment and care. The question – why Aboriginal and Torres Strait Islander peoples are overrepresented in prisons – is complex. It can partly be explained by exploring how structural, geographic, historic, social and cultural factors intersect and impact individuals’ lives. Issues of access and equity also disadvantage Aboriginal and Torres Strait Islander peoples in their dealings with the justice system. Some of these may relate to their geographical location – remote and very remote regions have limited legal services. Given the limited service infrastructure available in remote settings, geography also determines people’s access to community based options. Aboriginal and Torres Strait Islander peoples’ experiences of institutional racism and discrimination, the trauma caused to members of the Stolen Generations and entire families and communities, which continues today with increasing numbers of children being placed in out-of-home care, contribute to the distrust, fear and unwillingness of many people to engage with legal services. Governments’ inertia and lack of commitment to genuinely addressing the issues have contributed to a worsening situation. The National Indigenous Law and Justice Framework 2009-2015 was never funded, attracted no buy in from state and territory governments, and the review findings of the Framework were never made public. Increasing funding for the corrective service sector will not and does not address the issue of Aboriginal and Torres Strait Islander peoples’ exposure to the justice system. As Allison and Cunneen note, ‘the solutions to offending are found within communities, not prisons.’[xiv] They are referring to justice reinvestment, a strategy and an approach, whereby correctional funds – a portion of money for prisons – are diverted back into disadvantaged communities. The concept of justice reinvestment centres on the belief that imprisoning people does not address the causal factors that give rise to their exposure to the justice system. Ignoring the causal factors leads not only to recidivism and repeat incarceration, it also reproduces intergenerational cycles of disadvantage and exposure to the justice system. Reinvesting the money into community identified and led solutions not only addresses causation; it also strengthens communities. Depending on the project, justice reinvestment may not only help to reduce people’s exposure to the justice system; it may also improve education, health, and employment outcomes for Aboriginal and Torres Strait Islander peoples. Emerging out of these inquiries is a growing understanding that closing the gap on justice outcomes must begin with a commitment to self-determination, community control, cultural safety and a holistic response. NACCHO’s member services – the ACCHOs – embody these principles. The cultural safety in which ACCHOs’ services are delivered is a key factor in their success. They provide comprehensive primary care consistent with clients’ needs. 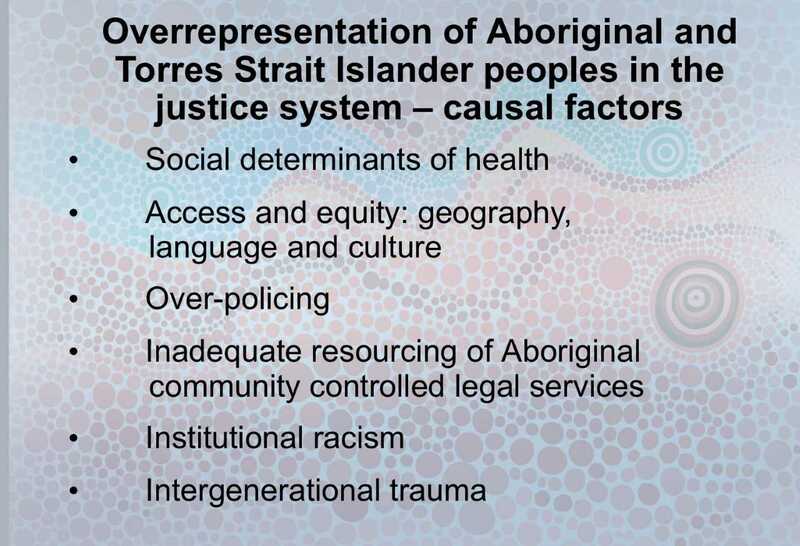 The Aboriginal Community Controlled Health model of care recognises that Aboriginal and Torres Strait Islander peoples require a greater level of holistic care due to the trauma and dispossession of colonisation, dispossession and discrimination, which are linked to our poor health outcomes and over-representation in prisons. ACCHOs understand the interplays between intergenerational trauma, the social determinants of health, family violence, and institutional racism, and the risks these contributing factors carry in increasing Aboriginal and Torres Strait Islander peoples’ exposure to the criminal justice system. We understand the importance of comprehensive health services that are trauma informed; and providing at risk families with early support. Within the principles, values and beliefs of the Aboriginal community controlled service model lie the groundwork for our communities’ better health outcomes. Given ACCHOs commitment to providing services based on community identified needs, it is not surprising, then, to learn that we are starting to address justice inequities by developing innovative partnerships with legal services. ACCHOs are increasingly recognising the benefits of working with legal services to develop options that enable services to be delivered seamlessly, safely, and appropriately for their communities. Lawyers may be trained to work as part of a health care team or alternatively, health care workers may be upskilled to start a non-threatening, informal conversation about legal matters with the clients, which results in referrals to pro bono legal services. As a lawyer and Chair of the Cairns-based Wuchopperen Health Service, I was aware of the need to provide better legal supports for my community. In conversations with local Elders and LawRight, Wuchopperen entered into a justice health partnership in 2016. LawRight is an independent, not-for-profit, community-based legal organisation which coordinates the provision of pro bono legal services for individuals and community groups. The aim of the partnership was to improve health outcomes by enhancing access to legal rights and early intervention. Initially, it was decided that, as community member and lawyer employed by LawRight, I would provide the free legal services at Wuchopperen’s premises. One of the challenges of justice health partnerships is ongoing funding, and in 2017 we were forced to close our doors for several months. We knew the partnership was addressing a real need in our community, so we submitted a funding proposal to the Queensland Government, and received funding of $55,000 to trial ‘Law Yarn’. 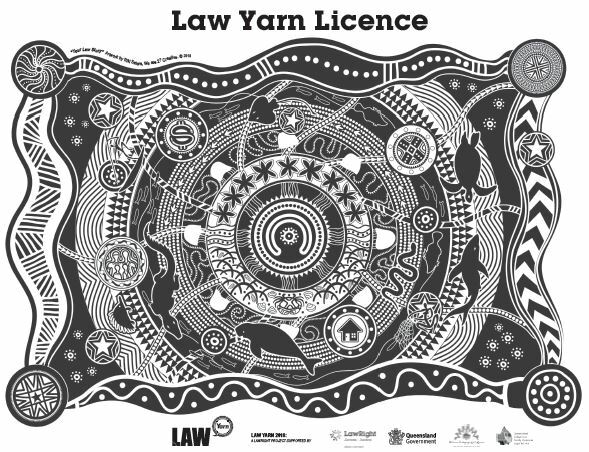 Law Yarn is a unique resource that supports good health outcomes in Aboriginal and Torres Strait Islander communities. It helps health workers to yarn with members of remote and urban communities about their legal problems and connect them to legal help. A handy how-to guide includes conversation prompts and advice on how to capture the person’s family, financial, tenancy or criminal law legal needs as well as discussing and recording their progress. Representatives from LawRight, Wuchopperen Health Service, Queensland Indigenous Family Violence Legal Service and the Aboriginal Torres Strait Islander Legal Services came together and created a range of culturally safe resources based on LawRight’s successful Legal Health Check resources. These symbols have been created to help identify and represent the four aspects of law that have been identified as the most concerning for individuals when presenting with any legal issues. If these four aspects can be discussed, both the Health worker and Lawyer can establish what the individual concerns are and effectively action a response. Each symbol is surrounded by a series of 10 dots; these dots can be coloured in on both the artwork and the referral form by the Health worker to help establish what areas of law their clients have concerns with. 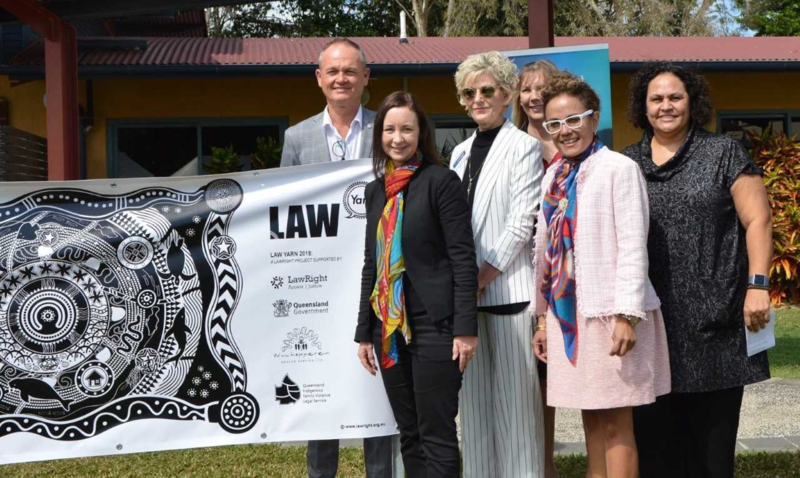 Law Yarn was officially launched at Wuchopperen Health Service, Cairns, on 30 May 2018 by the Queensland Attorney General as a Reconciliation Week Event. The trial has been funded to 30 June 2019 and will be comprehensively evaluated by independent academic researchers who specialise in this field. Legal and health services throughout Australia have expressed interest in this holistic approach to the health and wellbeing of Aboriginal and Torres Strait Islander peoples. And we are hopeful that the evaluation findings will support the rollout of our model to ACCHOs across Australia. In conclusion, I believe that the development of collaborative, integrated service models such as Law Yarn can provide innovative and effective solutions for addressing not only the overrepresentation of Aboriginal and Torres Strait Islander peoples in the justice system, but also the health gaps between Indigenous and non-Indigenous Australians. Address the legal problems, and you will have better health outcomes. 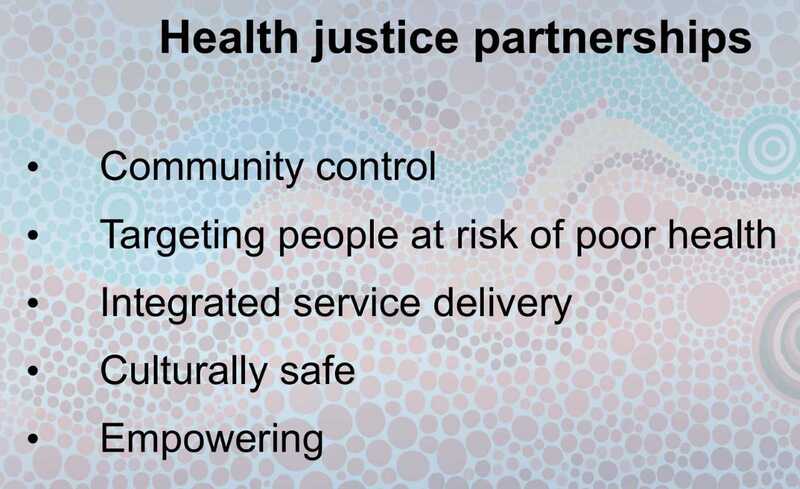 Justice health partnerships provide a model of integrated service delivery that go to the heart of the social determinants of health, key causal factors contributing to Aboriginal and Torres Strait Islander peoples’ over-exposure to the justice system. 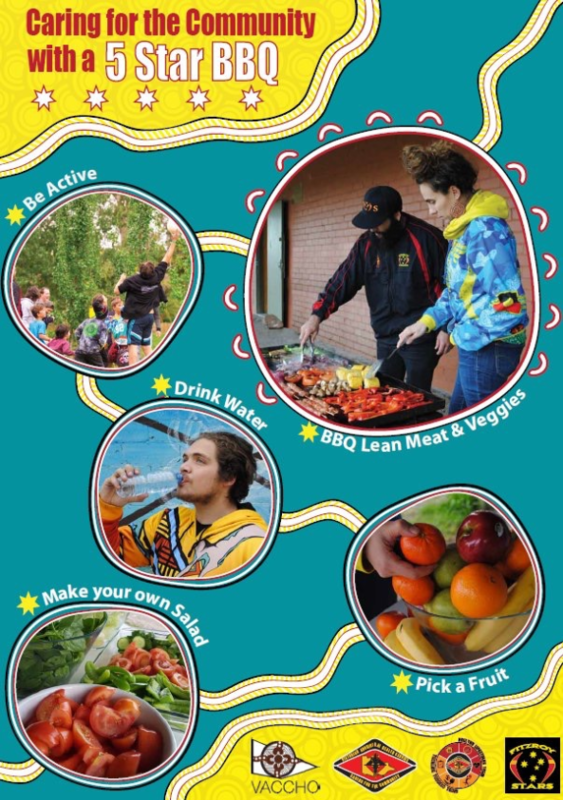 [xxi] With Aboriginal community control at the front and centre of service design, these partnerships are able to deliver both preventive law and preventive health for Aboriginal and Torres Strait Islander peoples. [i] Health Justice Australia. 2017. Integrating services; partnering with community. Submission to national consultation on Implementation Plan for the National Aboriginal and Torres Strait Islander Health Plan 2013-2023. [iii] Law Council of Australia. 2018. The Justice Project, Final Report – Part 1. Aboriginal and Torres Strait Islander People. [iv]. Law Council of Australia. 2018. The Justice Project, Final Report – Part 1. Aboriginal and Torres Strait Islander People. [v] Australian Institute of Health and Welfare. 2018. Youth detention population in Australia. AIHW Bulletin 145. [vi] Ibid., 2010 Senate Inquiry into hearing health in Australia. [vii] Australian Human Rights Commission. 2009. Social Justice Report, pp. 53-54, cited in Finance and Public Administration References Committee. 2016. Aboriginal and Torres Strait Islander experience of law enforcement and justice services. The Senate: Australian Parliament House. [viii] Law Council of Australia. 2018. The Justice Project, Final Report – Part 1. Aboriginal and Torres Strait Islander People. [ix] Finance and Public Administration References Committee. 2016. Aboriginal and Torres Strait Islander experience of law enforcement and justice services. The Senate: Australian Parliament House; Law Council of Australia. 2018. [x] Finance and Public Administration References Committee. 2016. Aboriginal and Torres Strait Islander experience of law enforcement and justice services. The Senate: Australian Parliament House. Testimony from Chief Justice Martin. [xi] Finance and Public Administration References Committee. 2016. Aboriginal and Torres Strait Islander experience of law enforcement and justice services. The Senate: Australian Parliament House; Law Council of Australia. 2018. The Justice Project, Final Report – Part 1. Aboriginal and Torres Strait Islander People. [xii] National Aboriginal and Torres Strait Islander Legal Service, Submission No. 109 to ALRC, 60, cited in Law Council of Australia. 2018. The Justice Project, Final Report – Part 1. Aboriginal and Torres Strait Islander People. [xiii] Finance and Public Administration References Committee. 2016. Aboriginal and Torres Strait Islander experience of law enforcement and justice services. The Senate: Australian Parliament House, p. 31. Testimony from Ms Porteous, NACLC, Committee Hansard, 23 September 2015, p. 28. [xiv] Allison, Fiona and Chris Cunneen. 2018. Justice Reinvestment in Northern Australia. The Cairns Institute Policy Paper Series, p. 5. [xv] Allison, Fiona and Chris Cunneen. 2018. Justice Reinvestment in Northern Australia. The Cairns Institute Policy Paper Series, p. 8. [xvi] Finance and Public Administration References Committee. 2016. Aboriginal and Torres Strait Islander experience of law enforcement and justice services. The Senate: Australian Parliament House. [xvii] Australian Law Reform Commission. 2017. Pathways to Justice—An Inquiry into the Incarceration Rate of Aboriginal and Torres Strait Islander Peoples, Final Report No 133, p. 17. [xviii] Thorburn, Kathryn and Melissa Marshall. 2017. 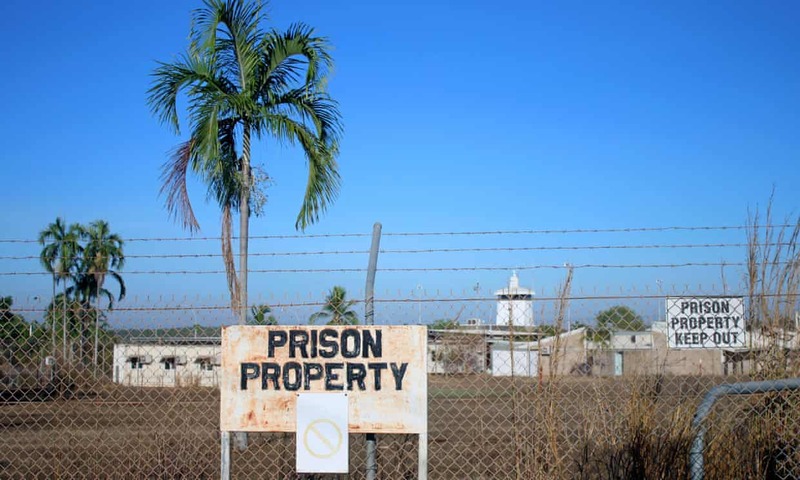 The Yiriman Project in the West Kimberley: an example of justice reinvestment? Indigenous Justice Clearinghouse, Current Initiatives Paper 5; McCausland, Ruth, Elizabeth McEntyre, Eileen Baldry. 2017. Indigenous People, Mental Health, Cognitive Disability and the Criminal Justice System. Indigenous Justice Clearinghouse. Brief 22; AMA Report Card on Indigenous Health 2015. 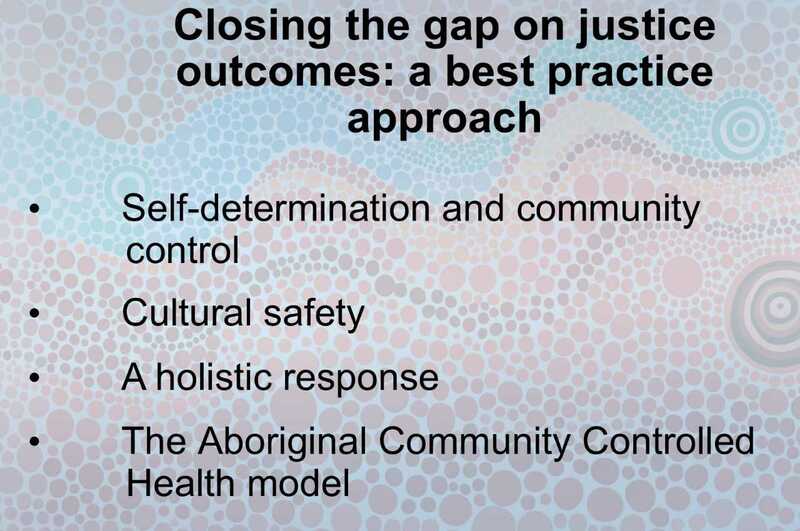 Treating the high rates of imprisonment of Aboriginal and Torres Strait Islander peoples as a symptom of the health gap: an integrated approach to both; Richards, Kelly, Lisa Rosevear and Robyn Gilbert. 2011. Promising interventions for reducing Indigenous juvenile offending Ibid. Indigenous Justice Clearinghouse, Brief 10. [xix] Health Justice Australia. 2017. Integrating services; partnering with community. Submission to national consultation on Implementation Plan for the National Aboriginal and Torres Strait Islander Health Plan 2013-2023. [xxi] Ibid., p. 4; Chris Speldewinde and Ian Parsons. 2015. Medical-legal partnerships: connecting services for people living with mental health concerns. 13th National Rural Health Conference, Darwin; Barry Zuckerman, Megan Sandel, Ellen Lawton, Samantha Morton. Medical-legal partnerships: transforming health care. 2008. The Lancet, Vol 372. 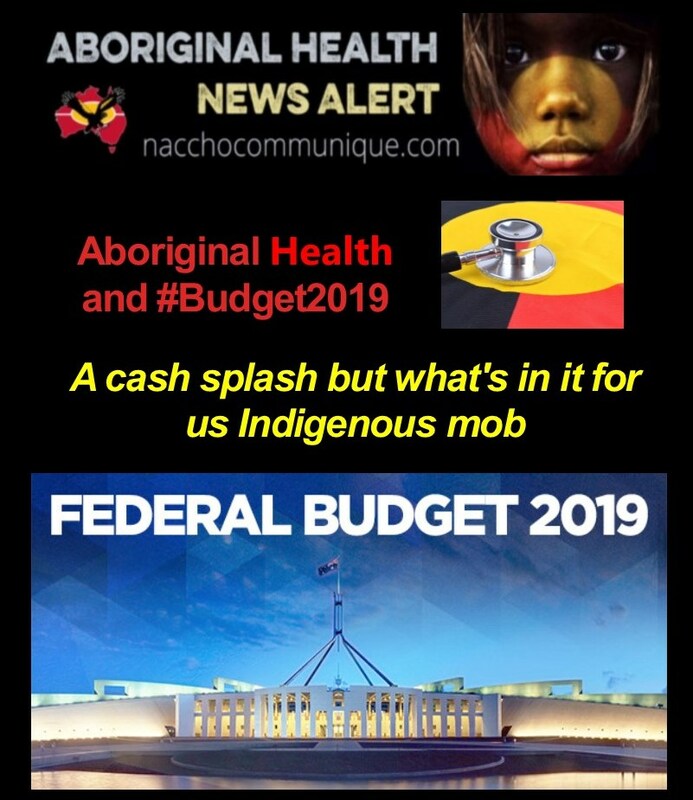 NACCHO Aboriginal #AusVotesHealth and #Budget2019 1 of 5 : @nakarithorpe @NITV Reports : A cash splash but what’s in it for Indigenous mob like @NACCHOChair @LowitjaInstitut @congressmob @NATSILS_ @NationalFVPLS? “The treasurer kept on about how we are geared towards surplus. We need to focus on the most vulnerable and marginalised in our community, but this budget does nothing for my mob. I don’t need another reminder that colonisation is still living. I don’t need to be reminded of that; we see it every day. I need to be reminded of the Uluru statement from the heart. For more discussion of Budget 2019, watch NITV’s The Point, 8.30pm tonight on Channel 34. Federal treasurer, Josh Frydenberg, has handed down his first budget and has described it as being “back in the black” with a budget surplus of $7.1 billion expected to be delivered next financial year, but the treasurer acknowledged “serious challenges” lay ahead. “The global economy is slowing. Communities are feeling the impacts of flood, fire and drought. Families face cost of living pressures. And every one of us wants to see wages growing faster. But let me be clear: the answer to these challenges is not higher taxes,” he said. The 2019 Budget sees further tax relief for low to middle-income earners. It also includes a record $100 billion National Infrastructure Plan and a $525 million skills package which the treasurer said will create 80,000 apprenticeships. However, despite the Coalition’s rhetoric about a “stronger economy”, spending on Indigenous programs and services was lacklustre, with specific expenditure buried deep in the budget papers. The government said it will invest $160 million for Indigenous health, with $10 million going to the Lowitja Institute, the national institute for Aboriginal and Torres Strait Islander health research. Ms Janine Mohamed, interim CEO fro the institute welcomed the investment and thanked Ken Wyatt, the minister for Indigenous Health. “The new funding will ensure that the Lowitja Institute continues to deliver public value of more than $3 per every $1 invested, and will enable us to remain as a key component of the national research architecture,” she said. $35 million will go toward funding Aboriginal and Torres Strait Islander-specific solutions to family violence. $5 million over four years will also go toward implementing Indigenous suicide prevention, to be led by young Indigenous leaders. A further $4.5 million will be for Indigenous leadership to create a national plan for culturally appropriate care, and $3 million for a centre of excellence in childhood wellness. Chief executive of the Congress of Aboriginal and Torres Strait Islander Nurses and Midwives (CATSINAM), Melanie Robinson, said she was disappointed about the lack of expenditure in youth suicide. An additional $60 million will be spent upgrading roads in the Tiwi Islands, as part of a $492.3 million Roads of Strategic Importance to the Northern Territory, which was provided for in last year’s federal budget. The government will also put $276.5 million over five years into supporting Indigenous students as part of its Closing the Gap refresh. A further $5 million will go to promote school attendance in remote communities. Another $70.6 million will cover the cost of extinguishing Higher Education Loan Program (Help) debts for teachers after they undertake a four-year placement in very remote locations, as announced in February. An increase of less than $20 million has gone towards legal assistance, prompting the Law Council of Australia to label the allocation “abysmal”. They say the figure falls well short of the additional $310 million per year needed to provide adequate access to legal justice. “The Budget may be in surplus but Australia will remain in a significant justice deficit so long as the government fails to deliver adequate funding for Legal Aid Commissions (LACs), Community Legal Centres (CLCs), Aboriginal and Torres Strait Islander Legal Services (ATSILS) and Family Violence Prevention Legal Services,” said Arthur Moses, the president of the Law Council of Australia. Mr Moses did however acknowledge that reversing proposed cuts and providing additional funding of $16.7 million over three years for ATSILS was welcome, saying the decision to dissolve the Indigenous Legal Assistance Program and roll funding for ATSILS into a single funding mechanism could threaten the independence of those services. 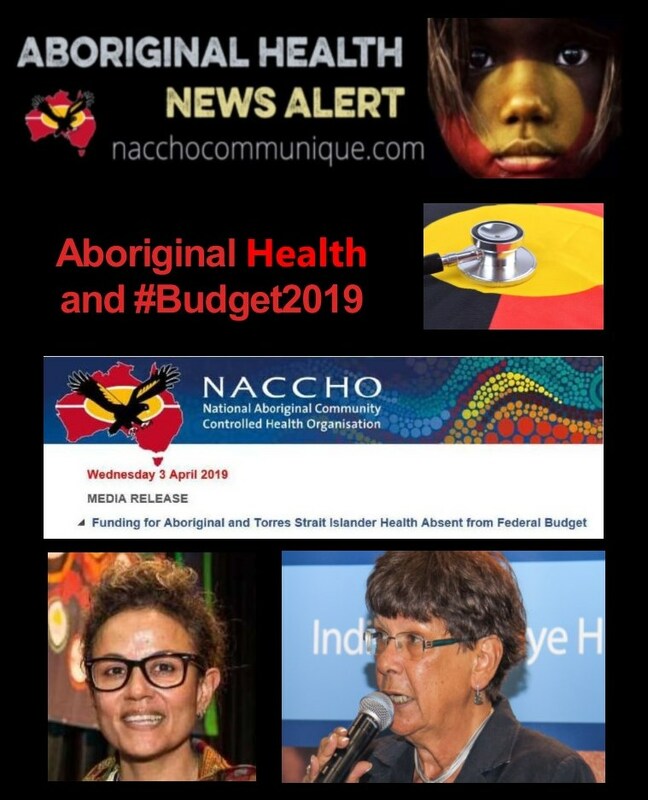 National Congress of Australia’s First Peoples Co-Chair, Dr Jackie Huggins, said it was still too early to know the “actual detail” of the impact of the budget on funding for Aboriginal and Torres Strait Islander organisations and interests. There are some glimmers of hope, said Ms Huggins, particularly around the Royal Commission into the abuse and neglect of people with a disability, women’s safety and health initiatives and education, but she said Congress still had questions. “No progress has been made on the economic empowerment of Aboriginal and Torres Strait Islander peoples,” she said. Ivan Simon, co-chair of the National Aboriginal and Torres Strait Islander Housing Authority, said he was sad and disappointed about the lack of remote housing commitment. “I didn’t see much in there. I guess the devil is in the detail,” he told NITV News. Mr Simon said he was concerned about how Indigenous housing service providers will be involved in the rollout of a $315 million social bond into mainstream community housing. “We find it very difficult to play in that mainstream system,” he said. Finance Minister Matthias Cormann told NITV News his government considered Indigenous Australians a priority. “From Tony Abbott to Malcolm Turnbull and Scott Morrison, it’s been a very strong personal priority of three prime ministers, and of course it’s a priority for Nigel Scullion… We are strongly committed to Closing the Gap and there is increased funding right across the board,” he said. We’re at a crossroads, and we’ve decided to take up our rightful role. I want our people living in safe, secure housing. I want them to have access to community-controlled health services no matter where they live. I want our people to have the best access to all education services, and I want our people to generally have the same opportunities as other Australians,” Ms Turner said. 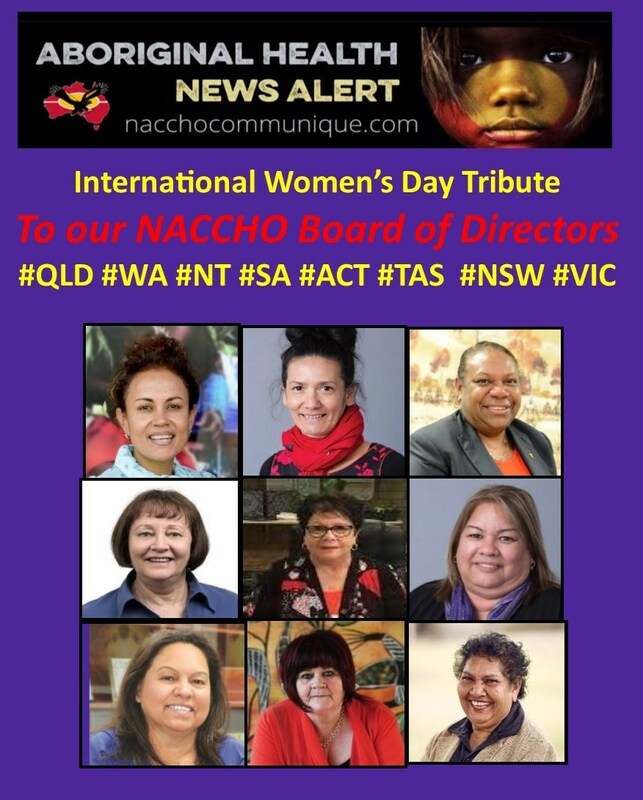 National Aboriginal Community Controlled Health Organisation (NACCHO) CEO Pat Turner. 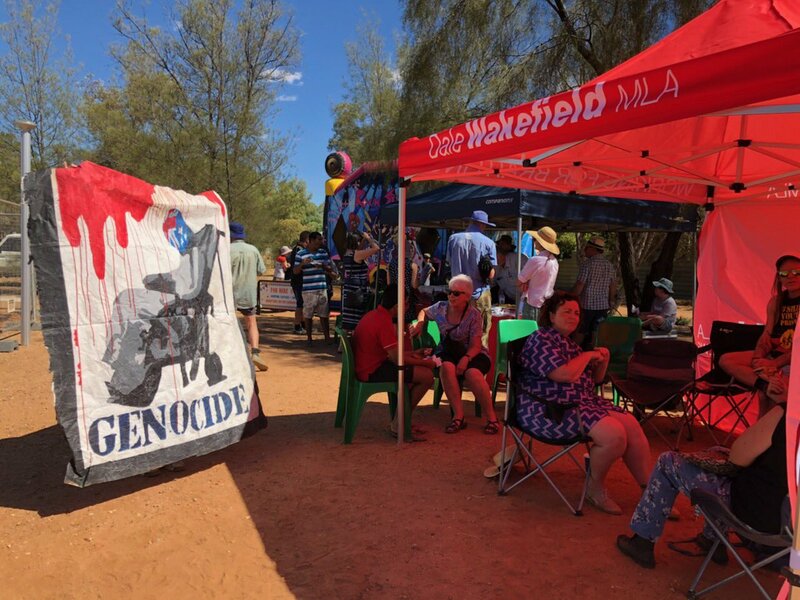 Aboriginal Medical Services Alliance Northern Territory chief executive, John Paterson, said the agreement also means Indigenous groups are just as accountable as governments. “ Labor welcomes the Closing the Gap Partnership Agreement announced by the Coalition Government and the Coalition of Peaks, made up of some 40 Aboriginal and Torres Strait Islander national and state /territory peaks and other organisations across Australia. A formal agreement with First Nations organisations and providers to work together to Close the Gap is long overdue. 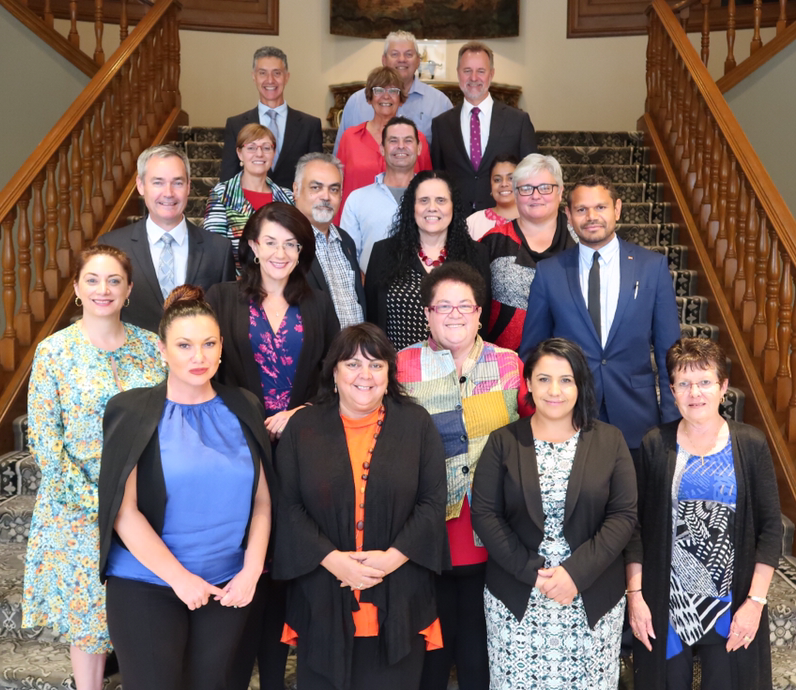 The Council of Australian Governments has unveiled an historic partnership with Aboriginal and Torres Strait Islander organisations, as they look to refresh the Closing the Gap strategy and turn around a decade of disappointing results. Aboriginal and Torres Strait Islander groups have sat down with state, territory and Commonwealth ministers, for the first time, to work on Closing the Gap. Under a ten-year agreement, Indigenous peak bodies will share ownership and accountability to deliver real, substantive change for Indigenous Australians. The partnership marks an historic turning point for the Closing the Gap strategy, which for the past eleven years has seen dismal results in delivering better outcomes for Indigenous Australians. Last year, just two of the seven targets were on track to being met. Representatives of around 40 Indigenous peak bodies, making up a ‘coalition of peaks’ will co-chair a new joint council alongside ministers. 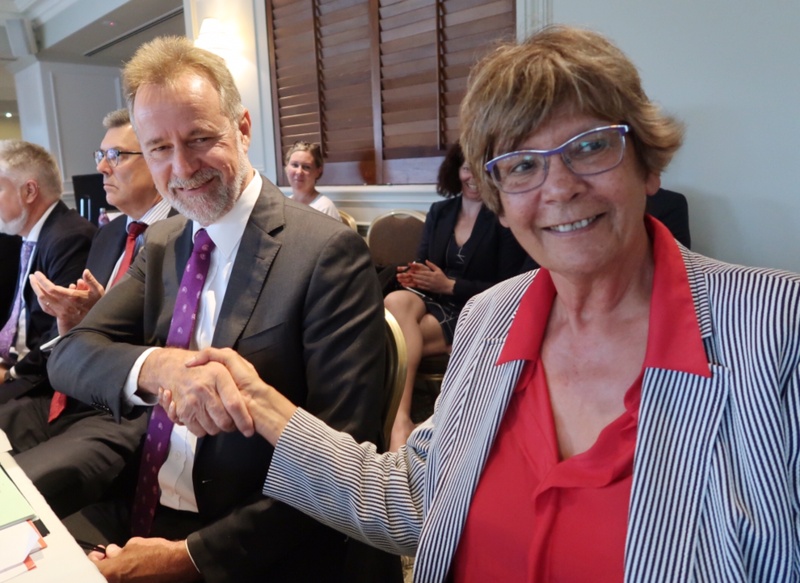 Ms Turner and Indigenous Affairs Minister Nigel Scullion co-convened the first meeting in Brisbane on Wednesday. The Morrison government is committing $4.6million over three years to fund the coalition’s secretariat work, and additional funding is expected in next Tuesday’s budget for the Closing the Gap refresh framework. “Our focus is on the Close the Gap. We in no way are the ‘voice’ – that is a process that still has to be settled by the incoming government at the federal level,” she said. The framework will undergo Indigenous-led evaluations every three years. Details of new targets are expected to be revealed in mid-2019 but Indigenous groups have already flagged key areas of concern. “We’ve got too many people in juvenile justice, we’ve got too many children being removed from their families, we’ve got so much family violence, drug and alcohol abuse. And all those issues, this Closing the Gap can do something about,” said Victorian Aboriginal Community Controlled Health Organisation chief executive, Muriel Bamblett. Ms Bamblett told NITV she hopes the new agreement will bring about real outcomes for Aboriginal and Torres Strait Islander people on the ground. 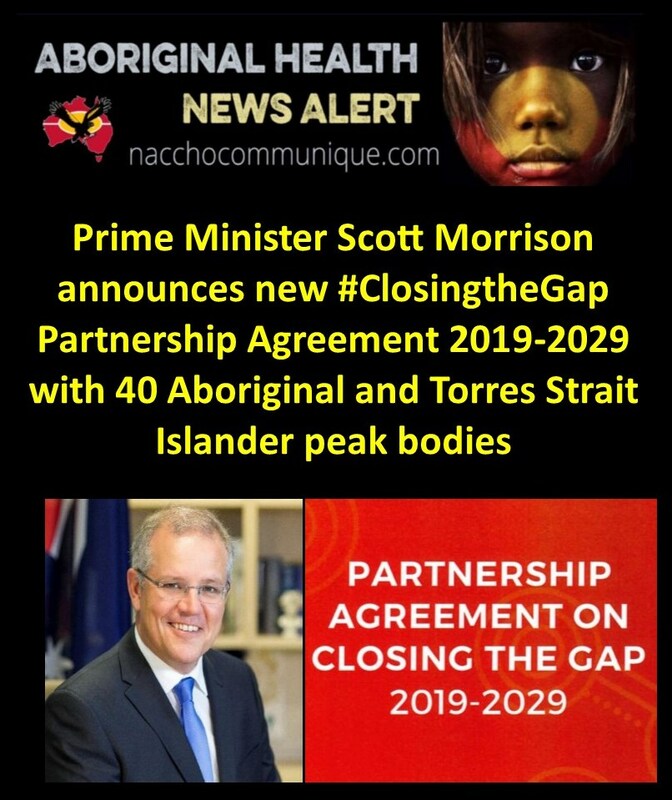 NACCHO Aboriginal Health and #ClosingTheGap Prime Minister Scott Morrison announces new #ClosingtheGap Partnership Agreement 2019-2029 with 40 Indigenous peak bodies able to engage and negotiate as equal partners with governments to design and monitor Closing the Gap. “The Closing the Gap Partnership Agreement will focus all of our efforts to deliver better health, education and employment outcomes for Indigenous Australians. It recognises that Aboriginal and Torres Strait Islander peoples must play an integral part in making the decisions that affect their lives. This agreement will put Indigenous peoples at the heart of the development and implementation of the next phase of Closing the Gap, embedding shared decision making and accountability at the centre of the way we do business. Prime Minister Scott Morrison said the new Closing the Gap Partnership Agreement between the Federal Government, states, territories and the National Coalition of Aboriginal and Torres Strait Islander Peak Organisations (Coalition of Peaks) would ensure decision makers worked closer than ever to deliver real change for Indigenous Australians. “The historic Partnership Agreement means that for the first time Aboriginal and Torres Strait Islander peoples, through their peak bodies, will share decision making with governments on Closing the Gap. Closing the gap is not just about targets and programs. It is about making sure that Aboriginal and Torres Strait Islander peoples can share in the decision making about policies and programs that impact on them and have a real say over their own lives. An historic agreement is set to change the way governments and Indigenous Australians work together on Closing the Gap. The Agreement was developed collaboratively with the Coalition of Peaks, the largest group of Indigenous community controlled organisations, and committed to by all levels of government. It builds on the December 2018 decision by the Council of Australian Governments to establish a formal partnership on Closing the Gap between governments and Indigenous Australians. The partnership will include a Joint Council on Closing the Gap, which for the first time will include ministers nominated by jurisdictions, together with Aboriginal and Torres Strait Islander representatives chosen by the Coalition of Peaks. Minister for Indigenous Affairs Nigel Scullion will co-chair the first meeting of the Joint Council alongside Pat Turner, CEO of the National Aboriginal Community Controlled Health Organisation and on behalf of the Coalition of Peaks. “The Joint Council represents an historic step forward in the practical working relationship between Aboriginal and Torres Strait Islander peoples and governments,” Minister Scullion said. “This is the first time Aboriginal and Torres Strait Islander representatives and ministerial leaders have met formally as part of a Joint Council to progress the Closing the Gap agenda and improve the lives of Indigenous Australians no matter where they live. “To support this historic partnership, we will deliver $4.6 million to the National Coalition of Aboriginal and Torres Strait Islander Peak Organisations to ensure the representatives of Aboriginal and Torres Strait Islander Australians are able to engage and negotiate as equal partners with governments to design and monitor Closing the Gap. “This is a new way of doing business that reflects that the top-down approach established in 2008 while well-intentioned, did not truly seek to partner with Aboriginal and Torres Strait Australians. We enter this partnership recognising that Canberra cannot change it all and that we need more then lofty goals and bureaucratic targets. “Finalising the refresh of the Closing the Gap framework and monitoring its implementation over the next ten years is critical to the future and prosperity of all Australians. Patricia Turner on behalf of the Coalition of Aboriginal and Torres Strait Islander Peak Organisations said almost 40 Aboriginal and Torres Strait Islander Peak Bodies across Australia had come together as partners with governments on Closing the Gap. The refreshed Closing the Gap framework and targets will be finalised through the Joint Council by mid-2019, ahead of endorsement by COAG. The Joint Council will meet for the first time on 27 March 2019 in Brisbane. 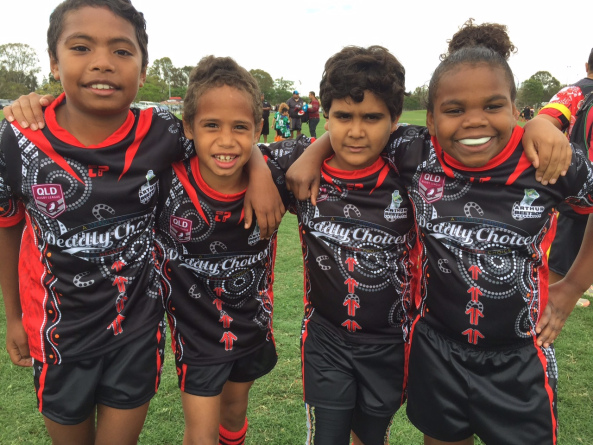 “Closing the gap is not just about targets and programs. It is about making sure that Aboriginal and Torres Strait Islander peoples can share in the decision making about policies and programs that impact on them and have a real say over their own lives. The National Aboriginal Community Controlled Health Organisation (NACCHO) has welcomed the signing of an historic Partnership Agreement on Closing the Gap between the Commonwealth Government, State and Territory Governments and the Coalition of Aboriginal and Torres Strait Islander Peak Bodies. The Coalition of Peaks is made up of around forty Aboriginal and Torres Strait Islander community controlled organisations that have come together to negotiate with governments and be signatories to the Partnership Agreement. 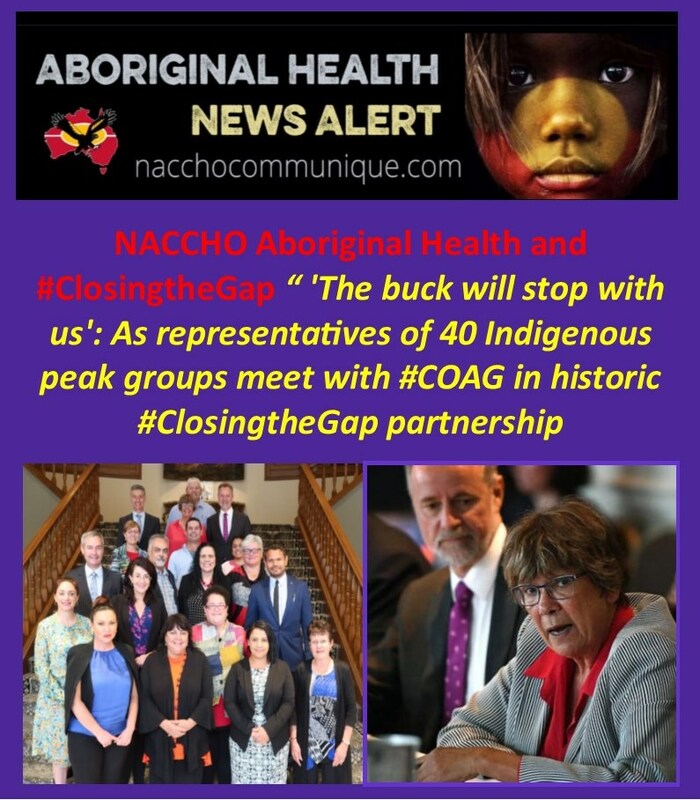 NACCHO Chief Executive, Pat Turner, said the Agreement means that for the first time Aboriginal and Torres Strait Islander people, through their peak body representatives, will share decision making with governments on Closing the Gap. 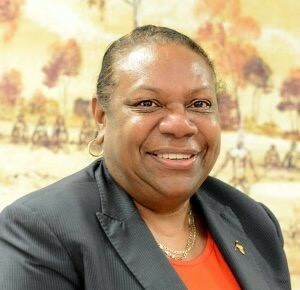 “For some time now, NACCHO, along with other Aboriginal and Torres Strait Islander Peak Organisations have been calling for a greater say with governments on efforts to close the unacceptable gaps in life outcomes between Aboriginal and Torres Strait Islander peoples and the broader community,” said Ms Turner. “The Coalition of Peaks believe that shared decision making between governments and Aboriginal and Torres Strait Islander community-controlled representatives in the design, implementation and monitoring of Closing the Gap is essential to closing the gap”. The Partnership Agreement sets out how governments and Aboriginal and Torres Strait Islander Peaks bodies will work together to agree a refreshed national agreement on Closing the Gap, including any new Closing the Gap targets and implementation and monitoring arrangements. Ms Turner said the Partnership Agreement also marks the establishment of a new, Joint Council on Closing the Gap that will be co-chaired by a Minister and a representative of the Coalition of Aboriginal and Torres Strait Islander Peak Bodies. “We look forward to a hardworking and constructive partnership with the Commonwealth, State and Territory Governments to secure better outcomes for Aboriginal and Torres Strait Islander Peoples,” said Ms Turner. So why was this bill kept from those who are part of those solutions and collaborations until the moment it was introduced into the parliament? It does not reflect the royal commission recommendations or the government’s previous policy position to accept and implement those recommendations. These amendments bring back the draconian treatment of young people and will see children restrained and isolated at the discretion of detention staff. The Chief Executive Officer of AMSANT, John Paterson The Aboriginal Medical Services Alliance of the Northern Territory (AMSANT) today condemned the Labor Government and Minister Wakefield in the strongest possible terms for its behaviour in avoiding debate and scrutiny in order to ram through retrograde changes to the Youth Justice Act for the operation of youth detention. “The Territory Labor Government is creating generational change and safer communities by overhauling the Youth Justice system and putting at-risk young people back on track. “The safety of youth detention staff and detainees is absolutely paramount. These amendments will help to better manage security risks that puts lives in danger. Mr Paterson, said “The Minister has been misleading and disingenuous in her speeches and answers to the limited questioning that was allowed in the Legislative Assembly. Despite the Minister’s assertions, these amendments are not mere technical clarifications. They are substantive changes that erode the small improvements that were made in 2018 in response to the Royal Commission. Mr Paterson said that the Bill passed this afternoon with no scrutiny, is clearly intended to retrospectively make lawful, actions that were unlawful under the law as it existed until today. “We must ask ourselves whether this unseemly and undemocratic haste is intended to defeat legal actions currently on foot by young people who believe their treatment in detention has been unlawful. Does the government know that unlawful treatment occurred and is now seeking to avoid accountability? It is difficult to draw any other conclusion despite the Minister’s obfuscation in the Assembly” said Mr Paterson. AMSANT believes that the harsh treatment of young people now permitted under the law will lead to increased tensions and incidents in detention. When the next major incident occurs, the government, not the young people, must be held to account. “Let’s not forget” said Mr Paterson “that a large proportion of young people in detention have significant cognitive disabilities. The government is condoning the use of restraint, isolation and physical force against young people with disabilities because they do not have the capacity to comply with the demands of the detention environment. “AMSANT is disgusted by this behaviour by a government and calls on the Chief Minister to withdraw this legislation prior to it receiving the assent of the Administrator. 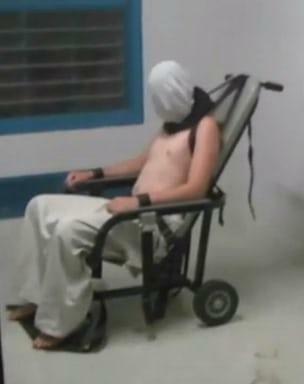 To do otherwise is to walk away from the Royal Commission recommendations.” said Mr Paterson. Mr Paterson seeks to remind the Chief Minister of his words and apparent distress when he responded to the Royal Commission. 1.2 Youth Justice Amendment Bill a return to the bad old days! 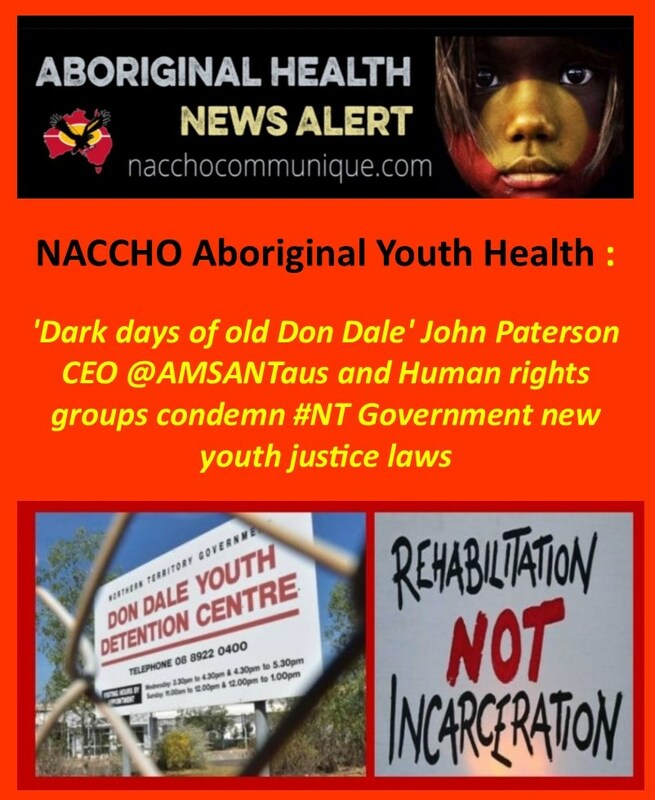 Aboriginal Medical Services Alliance of the Northern Territory (AMSANT) Chief Executive Officer, John Paterson, today called on the Chief Minister to halt the progress of the Youth Justice Amendment Bill 2019 through the Legislative Assembly until Aboriginal people and organisations have the chance to have a say. “The government talks proudly about its commitment to Aboriginal led solutions, to co-design and to collaboration” said Mr Paterson. “The Minister has said the Bill simply clarifies technical matters and keeps faith with 2018 amendments.” Mr Paterson said. Mr Paterson said that this Bill is a u-turn on the progress in 2018. It does not reflect the Royal Commission recommendations or the Government’s previous policy position to accept and implement those recommendations. If the workforce cannot safely deliver a detention system under current laws which give quite considerable powers over the young people, the government needs to look at the skills, training and support of the workforce to ensure that they can. Attacking the human rights of young people is not the solution” Mr Paterson emphasised. Mr Paterson noted that under the Diagrama Foundation which runs 70% of youth detention in Spain, for example, highly qualified staff with expertise in youth development, trauma and de-escalation work with young people in a therapeutic way that does not involve restraint, force and isolation. “Diagrama facilities rarely experience incidents of the kind seen last year at Don Dale. Today the Territory Labor Government passed amendments to the Youth Justice Act which will clarify and tighten the existing framework for managing safety and security risks within the youth detention centres. The amendments will provide youth detention centre staff with a clear and unambiguous framework for exercising their powers, and will enable them to have a very clear guideline in their decision making when responding to dangerous and challenging situations. The amendments will remove any uncertainty around the operation of existing powers in the legislation, for both youth detention centre staff and detainees. The amendments will apply retrospectively to the date in which the original provisions of the Act commenced (May 2018). This will remove any doubt about the original intention of these key provisions in the legislation. “Aboriginal women are the best advocates and leaders for health and wellbeing in their own families and in the broader community. They are proving to be effective role models, mentors and influencers for the next generation of Aboriginal female leaders. 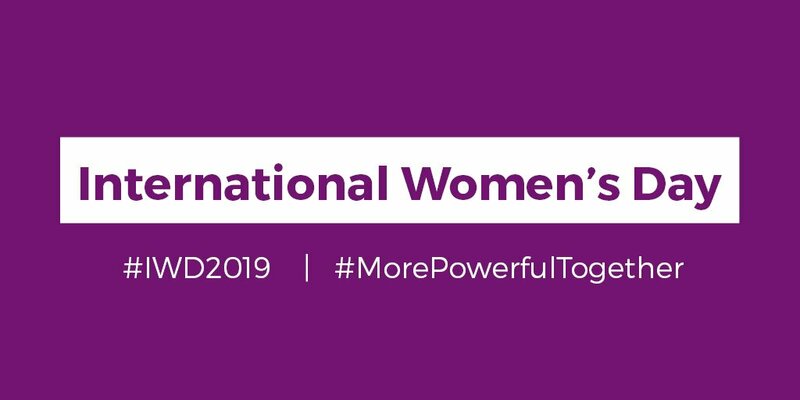 As mothers, aunts, grandmothers, sisters and daughters, Aboriginal and Torres Strait Islander women have culturally and historically always played a pivotal role in supporting and caring for families in our communities so working in the health sector was a natural progression. For over 47 years Indigenous health activists like Dr Naomi Mayers, Coleen Shirley (Mum Shirl) Smith AM MBE, Jill Gallagher AO, Vicki O’Donnell, Pamela Mam, and the late Mary Buckskin have been just some of our leaders who have successfully advocated for community controlled, culturally respectful, needs based approach to improving the health and wellbeing outcomes of our people. Our ACCHO network has successfully provided a critical and practical pathway for the education, training and employment for many Indigenous women.But much more needs to be done to develop viable career pathways to graduate more Indigenous women doctors, nurses and allied health professionals. 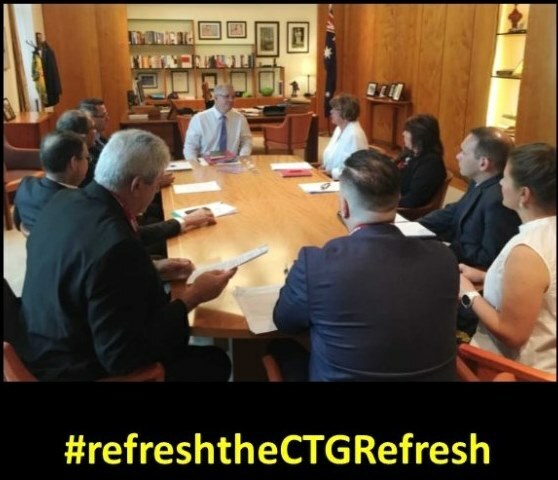 Last year NACCHO, RANZCOG and other medical college Presidents met with the Minister for Indigenous Health and other ministers in Canberra who are all determined to do everything possible to Close the Gap in health outcomes. Donnella is a Torres Strait Islander woman with ancestral and family links to Masig and Nagir in the Torres Strait. She is a Cairns–based lawyer with LawRight, a Community Legal Centre which coordinates the provision of pro-bono civil legal services to disadvantaged and vulnerable members of the community. Donnella is currently the project lawyer for the Wuchopperen Health Justice Partnership through a partnership with LawRight. This innovative Health Justice Partnership is an exciting model of providing access to justice, where lawyers and health professionals collaborate to provide better health outcomes and access to justice for patients with legal issues. Donnella said she was “very excited about the opportunity to contribute to working the new Chairperson, the new board and the NACCHO Executive to drive the national health debate, develop community led solution, and to champion why Community-Controlled is the pinnacle model in achieving greater autonomy and self-determination for Aboriginal and Torres Strait Islander people. Ms Ah Chee is the Chief Executive Officer of the Central Australian Aboriginal Congress Aboriginal Corporation, the Aboriginal community controlled primary health care service in Alice Springs. Ms Ah Chee is a Bundgalung woman from the far north coast of New South Wales and has lived in Alice Springs for over 25 years. She has been actively involved in Aboriginal affairs for many years, especially in the area of Aboriginal adult education and Aboriginal health. 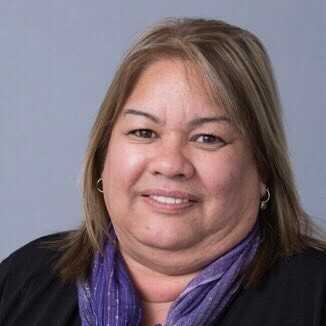 In June 2011, Ms Ah Chee moved to Canberra to take up the position of Chief Executive Officer of the National Aboriginal Community Controlled Organisation before returning to Congress in July 2012. Ms Ah Chee convened the Workforce Working Party under the Northern Territory Aboriginal Health Forum, was Chairperson of the Central Australian Regional Indigenous Health Planning Committee, a member of the Northern Territory Child Protection External Monitoring Committee and jointly headed up the Northern Territory Government’s Alcohol Framework Project Team. She currently sits on the National Drug and Alcohol Committee and at a local level, represents the Congress on the People’s Alcohol Action Coalition. LaVerne Bellear a descendant from the Nunukle Tribe of south-eastern Queensland, grew up in the northern part of the Bundjalung Nation (north coast New South Wales). LaVerne strongly believes that empowering Aboriginal people will create opportunity to make better informed decisions and choices regarding personal management of health care, ultimately resulting in better health outcomes. LaVerne has extensive experience in Aboriginal health, having worked in community health, Aboriginal controlled health services and as the Director, Aboriginal Health, Northern Sydney Local Health District. Recently, LaVerne has taken up the position of CEO, Aboriginal Medical Service Cooperative at Redfern, New South Wales. She has been a state representative on a number of working parties and committees concerning Aboriginal health. LaVerne has a Bachelor of Business, a Professional Certificate in Indigenous Research in Training and Practices and is studying a Master of Public Health at The University of New South Wales. Raylene Foster is a palawa women from the Cygnet area. She commenced her career in hospitality, becoming a chef, and then moved into adult teaching within the TAFE institute. She’s had varying roles within the TAC, including the Director of the Aboriginal Community School, Workforce Development Officer, Emotional and Social Wellbeing Coordinator and over the past 15 years the Manager of the Tasmanian Aboriginal Centre in the South, which includes the Aboriginal Health Service. Raylene has a Graduate Certificate in Administration and an Advanced Diploma in Human Resources, as well as Diploma of Alcohol and Other Drugs and Mental Health and a facilitator in the SMART Recovery program. Raylene is passionate about children’s wellbeing and keeping families connected to break the cycle of institutionalisation, separations and trauma-related illnesses. The Aboriginal cultural camp was an initiative that commenced in 2016 for Tasmanian registrars, GPs and members of the Tasmanian Aboriginal community. We wanted to go beyond the basic requirements of attendance at cultural training, to offer an immersion in to Aboriginal culture, on Aboriginal country, with mutual benefit for the Aboriginal and non-Aboriginal communities. The camp is held annually at trawtha makuminya, Aboriginal-owned land in the Central Highlands of Tasmania, from a Friday afternoon until a Sunday afternoon. Registrars, General Practitioners, Practice Staff and General Practice Training Tasmania staff and family members attend, in addition to the TAC staff Camp Organisers and Caterers, Cultural and Land Educators, Elders and community members. The weekend involves an official welcome speech, dance and music, yarning around the campfire, guided walks with discussion about Aboriginal history, the land and stone tools, kayaking, basket weaving, hand stencilling, clap stick making, and a session of “You Can’t Ask That”. There is a medical education session and participants hear from an Aboriginal Health Worker and Aboriginal Enrolled Nurse about the services offered by the Tasmanian Aboriginal Centre. There is a lot of informal discussion about culture and life stories shared by both the adults and the children. The feedback given to date, both informally and through the evaluation forms, is overwhelmingly positive. Participants value the beautiful location, the opportunity to spend time with community members outside the clinical setting, the obvious connection to country displayed by the Aboriginal community and the sharing of stories in a cultural exchange. Olga is of Western Arrente descent and grew up in Tennant Creek. Her great-grandfather was Ah Hong, a Chinese cook who worked on the Overland Telegraph Line whose partner was an Aboriginal woman in Alice Springs. Their daughter Gloria, Havnen’s grandmother, was the first Aboriginal woman to own a house in Alice Springs. Havnen’s father was a Norwegian sailor who jumped ship in Adelaide and her mother, Pegg lived in Tennant Creek. Havnen went to boarding school in Townsville, Queensland. 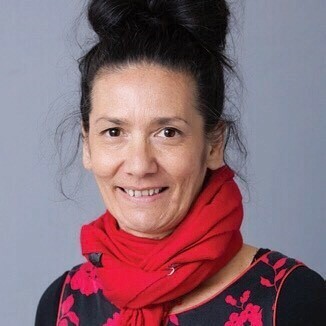 Olga Havnen has held positions as the Aboriginal and Torres Strait Islander Programs Co-ordinator for the Australian Red Cross, Senior Policy Officer in the Northern Territory Government’s Indigenous Policy Unit, Indigenous Programs Director with the Fred Hollows Foundation, and Executive Officer with the National Indigenous Working Group. And was the Coordinator General of Remote Service Provision from 2011 until October 2012, when the Northern Territory Government controversially abolished the position. She released one report which detailed deficiencies in Northern Territory and Commonwealth Government’s service provision to remote communities in the Northern Territory. She is currently the Chief Executive Officer of the Danila Dilba Health Service in Darwin, an Aboriginal Community Controlled Health Service. 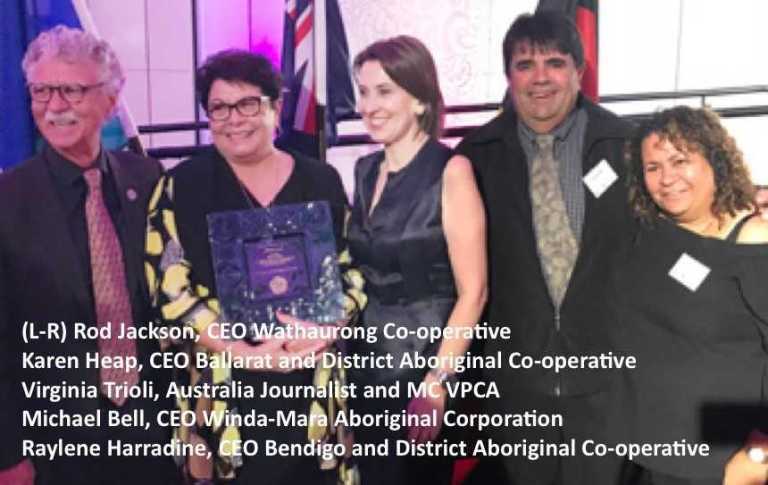 Karen Heap, a Yorta Yorta woman, has been the CEO of Ballarat and District Aboriginal Cooperative for 12 years and brings with her a vast amount of knowledge and skillsets procured from extensive experience within the Aboriginal Service Sector. Yorta and Wemba Wemba Elder who lived her life in the pursuit of equality. Aunty Walda was an early founder of the Dandenong and District Aboriginal Cooperative and worked for over 40 years improving the lives of the Aboriginal community. This award recognises contributions of an Aboriginal person in Victoria to the safety and wellbeing of Aboriginal and/or Torres Strait Islander children and young people. Karen ensures the safety and wellbeing of Aboriginal and/or Torres Strait Islander children and young people are always front and centre. Karen has personally committed her support to the Ballarat Community through establishing and continuously advocating for innovative prevention, intervention and reunification programs. As the inaugural Chairperson of the Alliance, Karen contributions to establishing the identity and achieving multiple outcomes in the Alliance Strategic Plan is celebrated by her peers and recognised by the community service sector and DHHS. Karen’s leadership in community but particularly for BADAC, has seen new ways of delivering cultural models of care to Aboriginal children, carers and their families, ensuring a holistic service is provided to best meet the needs of each individual and in turn benefit the community. Vicki Holmes is an Aboriginal woman descended from the Tanganekald and Western Aranda clan. Vicki has been with Nunkuwarrin Yunti for 32 years where she has had many roles; her first position was the medical receptionist but she also did whatever was needed including home visits, transport and hospital visits. In 1986, Vicki became the Health Coordinator and while in this role programs such as women’s health, HIV, diabetes, mental health and social/welfare support expanded and developed. In 2010, Vicki became the CEO of Nunkuwarrin Yunti of South Australia. 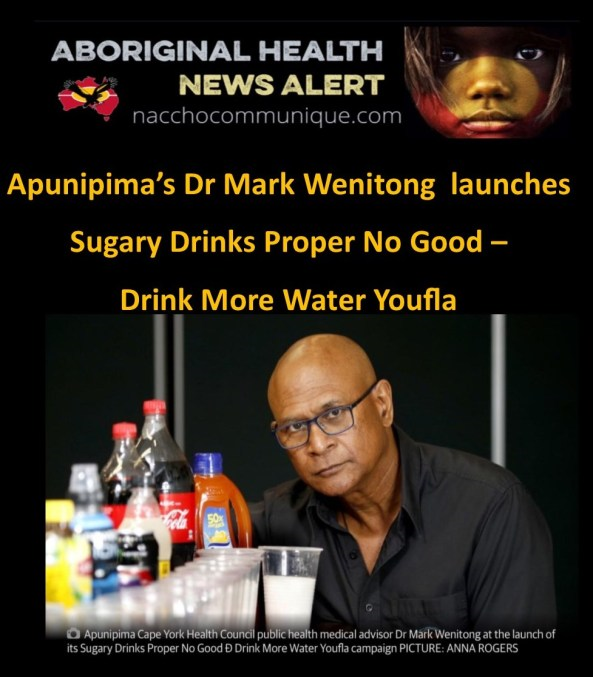 As CEO of Nunkuwarrin Yunti, she holds positions on the Boards of NACCHO, the Aboriginal Health Council of South Australia, Research Excellence in Aboriginal Community Controlled Health (REACCH), and First Peoples National Congress. Her vision for Nunkuwarrin Yunti is around what she calls the four Cs: Community, Communication, Caring, Consistency. 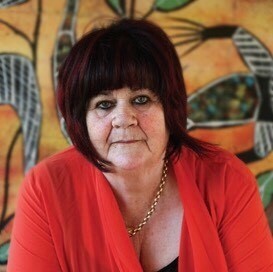 Vicki has always been passionate about the social and emotional wellbeing of the Aboriginal community. As an organisation, they continue to attract and employ culturally appropriate and professional staff members. SWAMS employs over 70 staff members including specialist Aboriginal Health Practitioners, Dietitians, Nurses, Midwives, Mental Health workers and Social Workers and because of this, we are able to provide a large and diverse range of services to the community. Last year as preparations got underway for the South West Aboriginal Medical Service’s 20th anniversary, centre chief executive officer Lesley Nelson has reflected on how far indigenous health has advanced in the South West in that time. Ms Nelson said the centre started small with a handful of staff and a desire to improve Aboriginal health outcomes in the region. Over the next 20 years, it expanded with clinics in Bunbury, Busselton, Manjimup, Collie and Brunswick. “We started after local elders held discussions with a number of key groups about developing a culturally appropriate service to address the health-related issues of the South West’s Indigenous population,” she said. Ms Nelson said the local service played an important role in the community. “Being based in a number of country towns ensured locals can access our services conveniently, especially if they lack transport options to the bigger cities,” she said. “We offer an important service because we intervene and manage issues early on and slowly we are improving the health of the South West Noongar people. Moving forward, SWAMS are keen to continue growing, participating in more research studies and working collaboratively with other similar services to offer a whole of community approach to improved health. 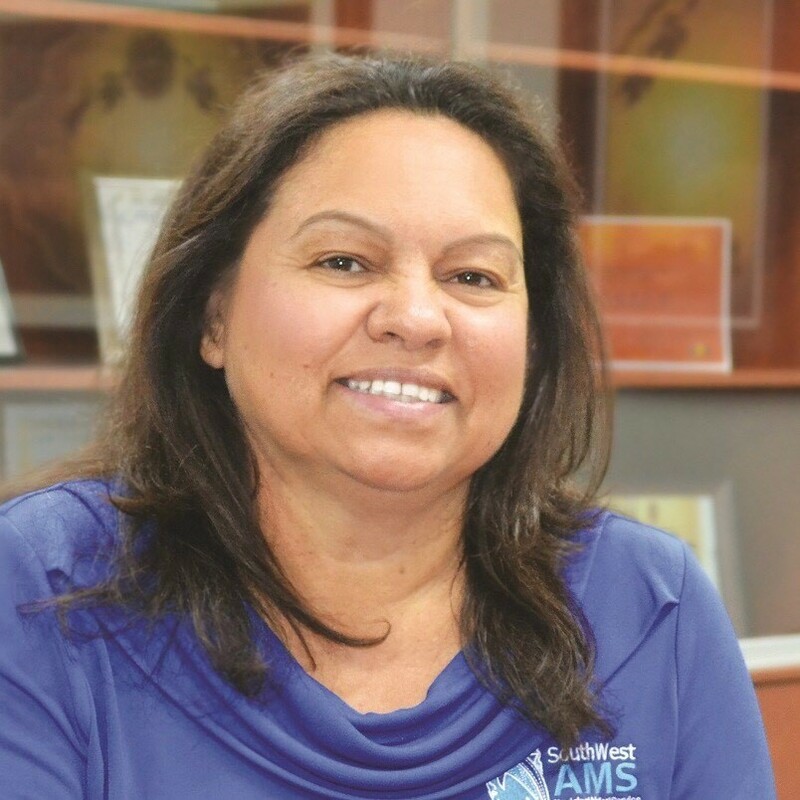 Julie Tongs OAM has been the Chief Executive Officer of Winnunga Nimmityjah Aboriginal Health and Community Services since 1998. 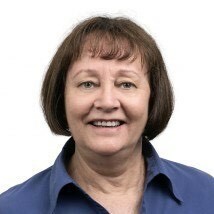 Julie has more than 30 years experience working in Aboriginal and Torres Strait Islander affairs and in particular has extensive experience in advising, formulating, implementing and evaluating public health initiatives, programs and policy at a local, regional and national level. Julie has been a national leader and strong advocate of quality improvement initiatives within the Aboriginal Community Controlled sector. Julie is the recipient of a number of awards, including the ACT Governor General’s Centenary Medal and the ACT Indigenous Person of the Year. In 2011 Julie received the ACT Local Hero Award within the Australian of the Year Awards 2012, and in 2012 Julie was honoured with the Medal of the Order of Australia. Julie’s vision is that Winnunga continues to build on its reputation as a national leader in the provision of holistic primary health care services delivered in a culturally appropriate environment that achieves improved health outcomes for Aboriginal and Torres Strait Islander people. Julie is committed to ensuring that Winnunga offers services that are delivered consistent with best practice standards. ‘We see the best way to build capacity and capability within our corporation is by encouraging strong leaders, maintaining effective governance, ensuring strong systems, and keeping focused on accountable performance management. Gail is the Chief Executive Officer of Mulungu Primary Health Care Service in Mareeba. She has over 25 years’ experience in Aboriginal affairs and health, and an unwavering commitment to improving the health and wellbeing of her community. Gail strives to ensure that the community has access to the full range of high quality, culturally appropriate primary health care services that empowers clients to fully participate in the management of their own health. 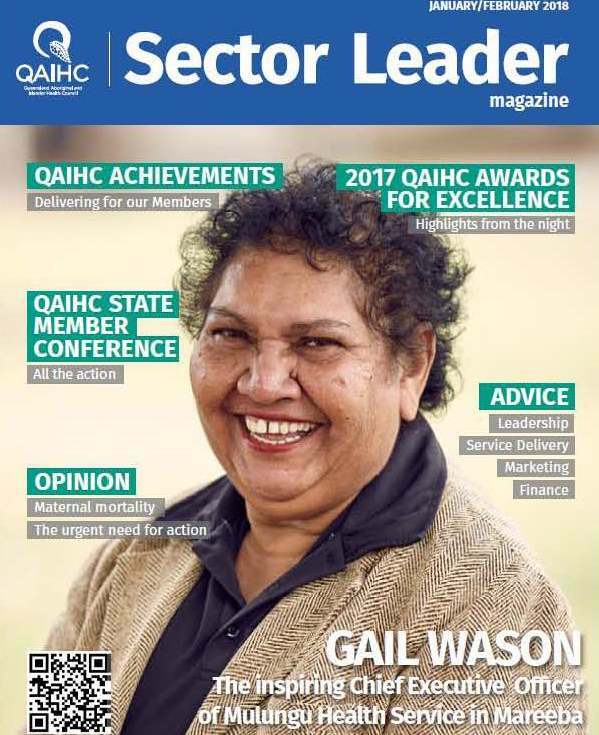 She has served as QAIHC’s Far North Queensland Director and Chairperson of QAIHC’s Finance Committee and has worked closely with the Board for many years. Mulungu Aboriginal Corporation Medical Centre is an Aboriginal community-controlled health organisation working to improve the lives of Indigenous people in and around Mareeba. The centre was established in 1991 and incorporated under the CATSI Act in 1993. The rural town of Mareeba—a word from local Aboriginal language meaning ‘meeting of the waters’—is located on the Atherton Tablelands where the Barron River meets Granite Creek. Traditionally Muluridji people inhabited this land. The town of Mareeba may be a little tucked away but it has much to offer, including Mulungu Aboriginal Corporation Medical Centre—a bright, open, modern building—which employs a large professional staff who work as a team and support each other. Everyone is passionate about providing top quality holistic health care to the community through Mulungu’s programs and services. Mulungu’s mission is to provide comprehensive primary health care to the community in culturally, socially and emotionally appropriate ways. It’s about handing back power to the people to manage their own health, wellbeing and spiritual needs. So as well as providing clinical health care services Mulungu ‘auspices’ other important primary health care programs, including the Mareeba Children and Families Centre (CFC), Mareeba Parent and Community Engagement (PaCE) Program, and the Mareeba Young and Awesome Project (MY&A). The MY&A Project tackles the problem of binge drinking in the community. Its aim is to motivate young people (aged 12 to 25) to get involved in constructive activities that they might enjoy—and to get them away from drinking alcohol. This two-year project is funded by the Australian Government. It’s all about changing and improving lives. To learn more about Mulungu Aboriginal Corporation Medical Service visit http://mulungu.org.au. ” Improving people’s health through better quality control and health data collection at local Aboriginal Community Controlled Health Services is the aim of a $2.8 million national project funded by the Federal Government. 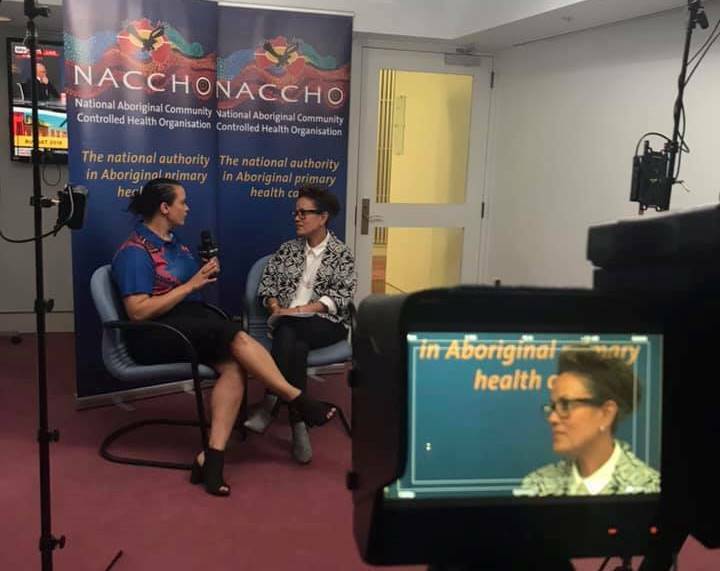 ” NACCHO is proud of the record of the Aboriginal Community Controlled Health Services (ACCHSs) in delivering primary health care to our community. We have learnt many lessons over the last 50 years about how to structure, deliver and improve care so that it best meet the needs of our communities across Australia. Further resources including the Framework are available on our NACCHO website. 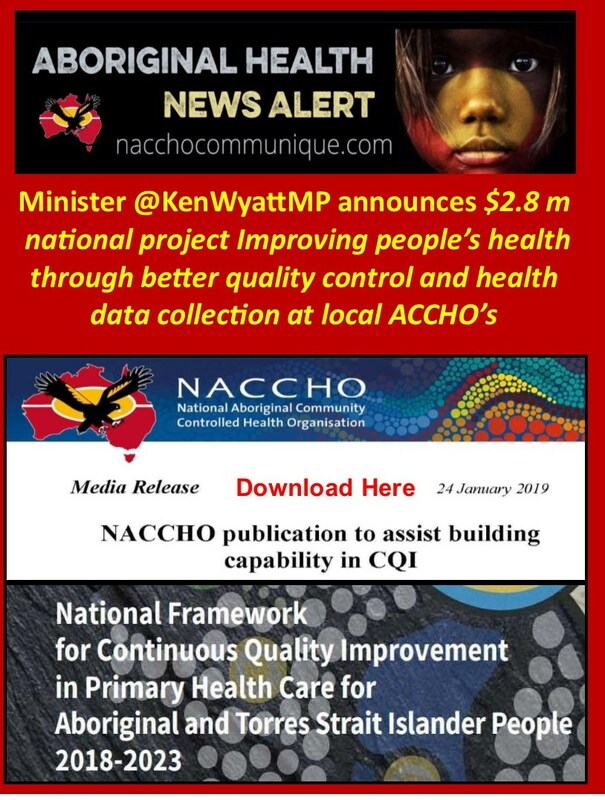 The National Aboriginal Community Controlled Health Organisation (NACCHO) has just published the National Framework for Continuous Quality Improvement in Primary Health Care for Aboriginal and Torres Strait Islander people, 2018-2023.
al Community Controlled Health Services and Affiliates, health professional organisations and government. The project was funded by the Commonwealth Department of Health. 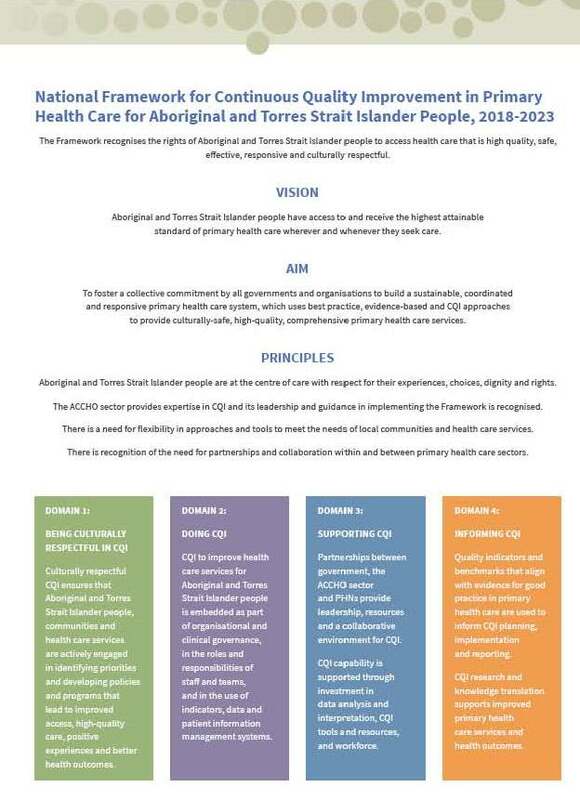 The CQI Framework provides principles and guidance for primary health care organisations in how to do, support and inform culturally respectful CQI. It is designed to assist Aboriginal health services and private general practices, NACCHO Affiliates and Primary Health Networks, national and state/territory governments in their efforts to ensure that Aboriginal and Torres Strait Islander people have access to and receive the highest attainable standard of primary health care wherever and whenever they seek care. It is relevant to clinicians, board members and practice owners, health promotion, administrative and management staff. Six case studies which illustrate how CQI has been implemented in ACCHSs are included. NACCHO welcomes further case studies from other health services, general practice and Primary Health Networks. Further resources including the Framework are available on the NACCHO website. 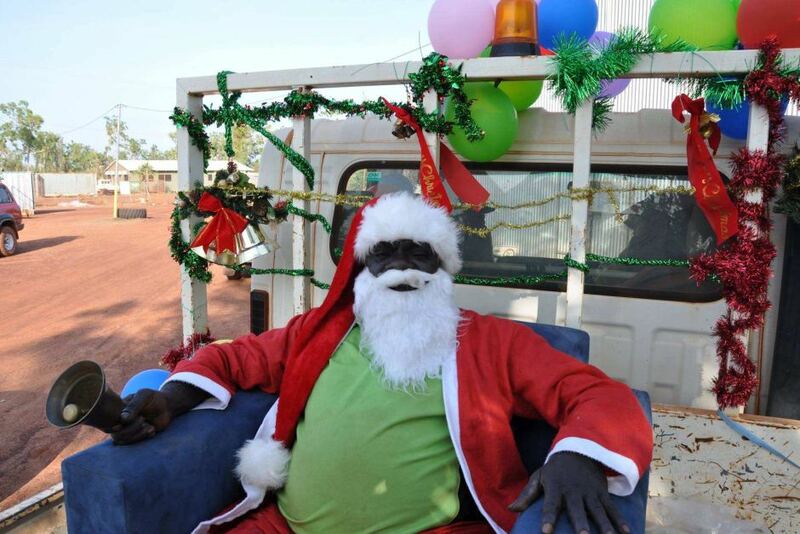 On behalf of NACCHO, the Board and our staff we wish you a safe, happy and healthy festive season. 2018 has been a year of change, with many new members joining the NACCHO Board. With change comes opportunity, 2019 will see many new and exciting developments as NACCHO continues to enhance better service for the sector. We look forward to building strong relationships with you, maintain Aboriginal community control and work together in the new year to improve health and well-being outcomes for Aboriginal and Torres Strait Islander peoples. If the NACCHO Christmas card isn’t playing, click here to view in a web browser. ‘Regular consumption of sugary drinks is associated with increased energy intake and in turn, weight gain and obesity. 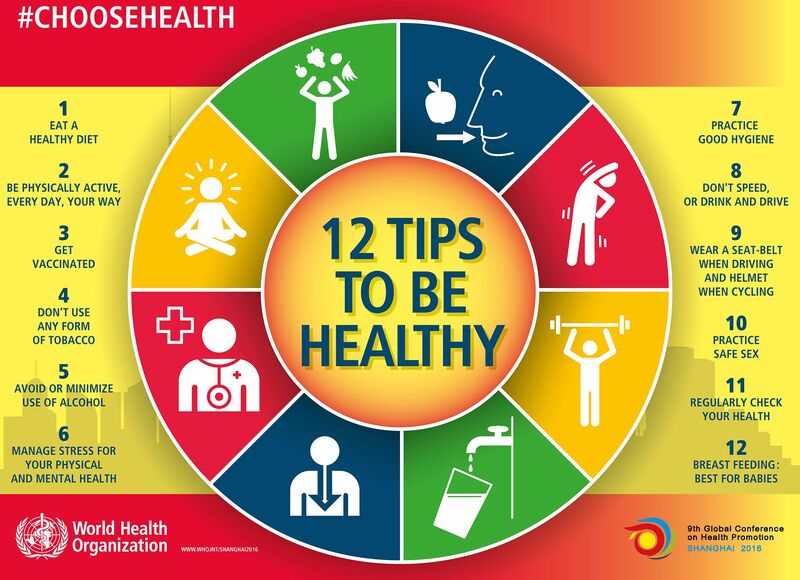 It is well established that obesity is a leading risk factor for diabetes, kidney disease, heart disease and some cancers. Consumption of sugary drinks is also associated with poor dental health. 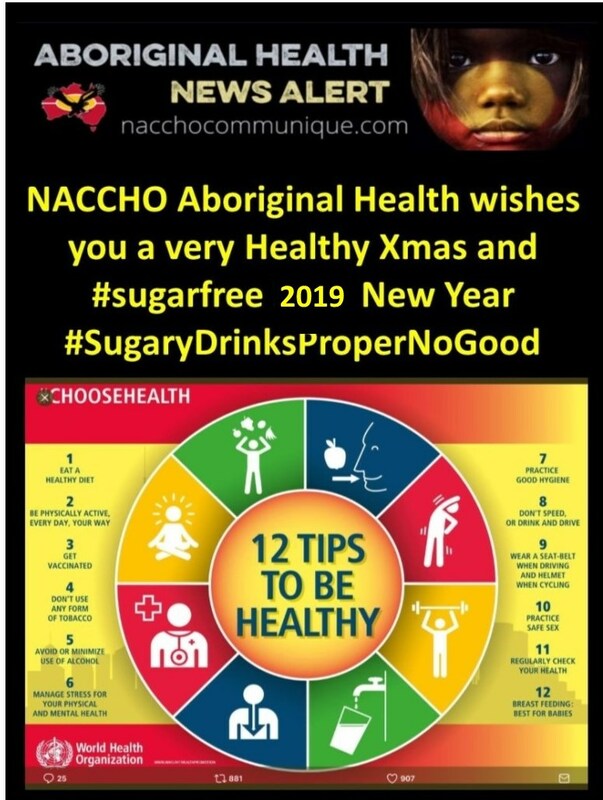 ” Let’s be honest, most countries and communities (and especially Aboriginal and Torres Strait Islanders ) now face serious health challenges from obesity. Even more concerning, so do our kids. While no single mission will be the panacea to a complex problem, using 2017 to set a new healthy goal of giving sugar the kick would be a great start. Understand sugar, be aware of it, minimise it and see it for what it is – a special treat for a rare occasion. This New Year’s, make breaking up with sugar your planned resolution. Australia enjoys enviable health outcomes but that is unlikely to last if we continue to experience among the world’s highest levels of obesity. ” Weight gain spikes sharply during the Christmas and New Year holiday period with more than half of the weight we gain during our lifetime explained just by the period between mid-November and mid-January. ” Labels that warn people about the risks of drinking soft drinks and other sugar-sweetened beverages can lower obesity and overweight prevalence, suggests a new Johns Hopkins Bloomberg School of Public Health study. The study used computer modelling to simulate daily activities like food and beverage shopping of the populations of three U.S. cities – Baltimore, San Francisco and Philadelphia. It found that warning labels in locations that sell sugary drinks, including grocery and corner stores, reduced both obesity and overweight prevalence in the three cities, declines that the authors say were attributable to the reduced caloric intake. The virtual warning labels contained messaging noting how added sugar contributes to tooth decay, obesity and diabetes. Global recognition is building for the very real health concerns posed by large and increasing quantities of hidden sugar in our diets. This near-ubiquitous additive found in products from pasta sauces to mayonnaise has been in the headlines and in our discussions. The seemingly innocuous sweet treat raises eyebrows from community groups to policy makers – and change is in the air. The global obesity epidemic continued to build while more than two-in-three Australian adults faced overweight or obesity – and almost one in four of our children. Science around sugary drinks further solidified, with consumption now linked to obesity, childhood obesity, heart disease, diabetes (type-2), dental caries and even lower fertility. Australians were estimated to consume a staggering 76 litres of sugary drinks each since January alone, and new reports highlighted that as much as 15% of the crippling health costs associated with obesity could result from sugary drinks consumption. Meanwhile around the planet, more countries took sound policy measures to reduce sugar consumption in their citizens. France, Belgium, Hungary, Finland, Chile, the UK, Ireland, South Africa and many parts of the United States implemented, continued or planned the implementation of pricing policies for sugary drinks. In short, the over-consumption of sugar is now well recognised as a public health challenge everywhere. With all this in mind and a New Year ahead, it’s time to put big words into local action. With resolutions brewing, here are seven helpful tips to breaking up with sugar in 2017. When it comes to sugar, things can get pretty confusing. Below, I shed some light on the common misunderstandings, but let’s recheck sugar itself – in simplest terms. Sugar is a type of refined carbohydrate and a source of calories in our diet. Our body uses sugar and other sources of calories as energy, and any sugar that is not used is eventually stored as fat in our liver or on our bellies. “Free sugars” are those added to products or concentrated in the products – either by us or by the manufacturer. They don’t include sugars in whole fruits and vegetables, but more on that later. For a range of health reasons, the World Health Organization recommends we get just 5% of our daily calories from free sugars. For a fully grown man or woman, this equates to a recommended limit to sugar consumption of roughly 25 grams – or 6 teaspoons. For women, it’s a little less again. Consume more than this, and our risk of health problems rises. 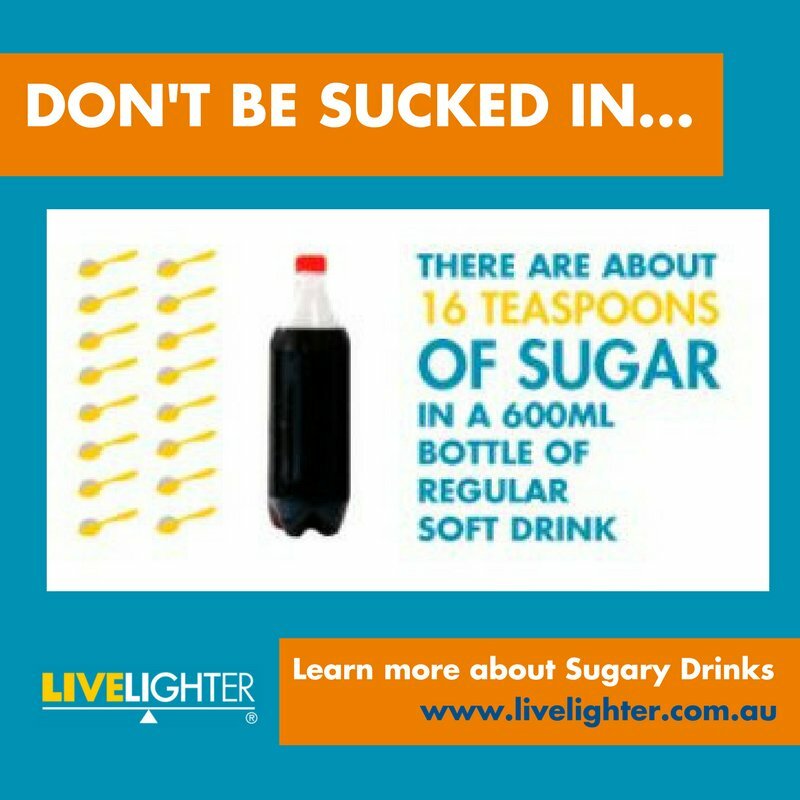 With 16 teaspoons of sugar in a single bottle serving – that’s more than 64 grams– there’s nothing “soft” about soft drinks. Including all carbonated drinks, flavoured milks and energy drinks with any added sugars, as well as fruit drinks and juices, sugary drinks are a great place to focus your efforts for a healthier 2018. Sugary drinks provide no nutritional value to our diets and yet are a major source of calories. What’s more concerning, evidence suggests that when we drink calories in the form of sugary drinks, our brains don’t recognise these calories in the same way as with foods. They don’t make us feel “full” and could even make us hungrier – so we end up eating (and drinking) more. In this way, liquid calories can be seen as even more troubling than other forms of junk foods. Combine this with studies that suggest the pleasure (and sugar spike) provided by sugary drinks may make them hard to give up – and it’s not difficult to see why many of us are drinking higher amounts, more often and in larger servings. This also makes cutting down harder. The outcome is that anything up to one-seventh of the entire public cost of obesity in Australia could now result from sugary drinks. In other words, cut out the sugary drinks and you’ll be doing your own health a favour – and the health of our federal and state budgets. When it’s wrapped in a peel or a skin, fruit sugars are not a challenge to our health. In fact, the sugars in fruit are nature’s way of encouraging us to eat the fruit to begin with. Fruits like oranges, apples and pears contain important fibres. The “roughage” in our foods, this fibre is healthy in many ways but there are three in particular I will focus on. First, it slows our eating down; it is easy to drink a glass of juice squeezed from 7 apples, but much harder to eat those seven pieces whole. Second, it makes us feel full or satiated. And third, it slows the release of the sugars contained in fruit into our blood streams, thus allowing our bodies to react and use the energy appropriately, reducing our chances of weight gain and possibly even diabetes. Juice, on the other hand, involves the removal of most of those fibres and even the loss of some of the important vitamins. 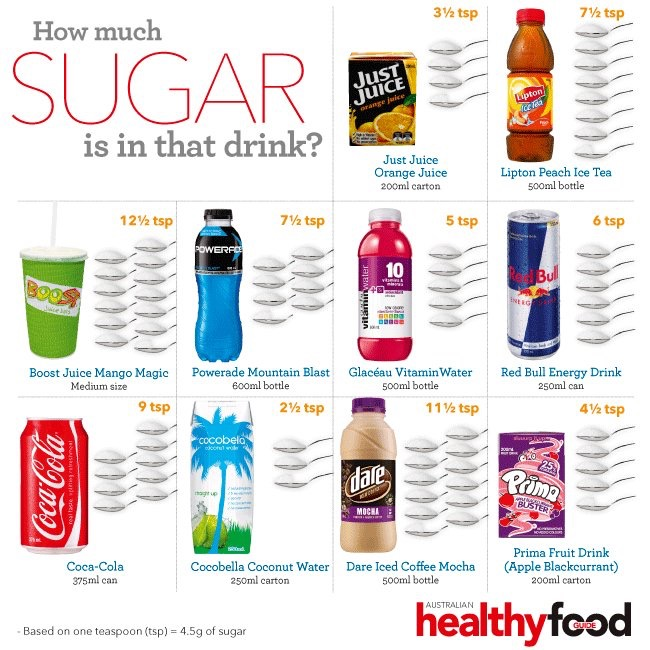 What we don’t lose though, is the 21 grams or more than five teaspoons of sugar in each glass. In short, eat fruit as a snack with confidence. But enjoy whole fruit, not juice. High-fructose corn syrup, invert sugar, malt sugar and molasses – they all mean one thing: sugar. Tomato sauce, mayonnaise, salad dressings, gravies, taco sauces, savoury biscuits and breakfast cereals – these are just some of the many foods now often packed with hidden, added sugars. A study found that 74% of packaged foods in an average American supermarket contain added sugars – and there is little evidence to suggest Australia would be dramatically different. Added to food to make it more enjoyable, and moreish, the next tip when avoiding such a ubiquitous additive is to eat whole foods. It’s hard to hide sugar in plain flour, or a tomato, or frozen peas. Buying and cooking with mostly whole foods – not products – is a great way to ensure you and your family are not consuming added sugars unaware. Words like “wholesome”, “natural” and “healthy” are clad on many of our favourite ingredients. Sadly, they don’t mean much. Even products that are full of sugar, like breakfast cereals and energy bars, often carry claims that aim to confuse and seduce us into purchase. Be wary – and be sure to turn the package over and read the ingredients and nutrition labelling where possible (and if time permits). The final but crucial message in all of this is that eating or drinking sugar is not a sin. Sugar is still a part of our lives and something to enjoy in moderation. The occasional piece of cake, or late night chocolate – despite the popular narrative painted by industry to undermine efforts for true pricing on sugar – these occasional sweet treats are not the driving challenge for obesity. The problem is that sugary drinks, and sugar in our foods, have become every day occurrences. With this in mind, let’s not demonise sugar but instead let’s see it for what it is. Enjoy some juice or bubbles from time to time but make water the default on an everyday basis. With the average can of cola containing 39 grams or 9 teaspoons of sugar, be OK with sometimes. Let’s be honest, We now face serious health challenges from obesity. 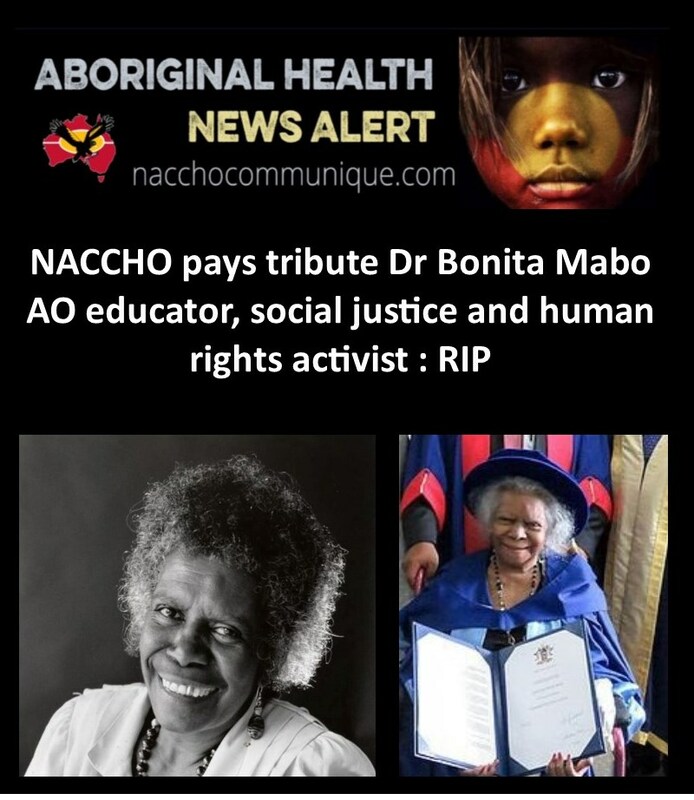 NACCHO Chair Ms Donnella Mills speaking on behalf of all the 145 Aboriginal Community Controlled Health Services throughout Australia has extended condolences to the Mabo family for the loss of their mother, sister, aunty, cousin and grandmother Dr Bonita Mabo, South Sea Islander reconciliation activist , who passed away Monday. “ Dr Mabo as the wife of Eddie Mabo, an Australian hero known for his long fight for Indigenous land rights, but Dr Mabo was more than a supportive partner, she was an educator and an advocate who was the co-founder of Australia’s first Indigenous community school, the Black Community School in Townsville, where she worked as a teacher’s aide and overseeing the day-to-day operations, including providing continuity and cultural training to all children including 10 of her own. She was considered to be a stabilising influence at the school at a time when it was considered unacceptable to have discrete curricula and teaching policies for Australian Aboriginal and Torres Strait Islander children “ Ms Mills said. 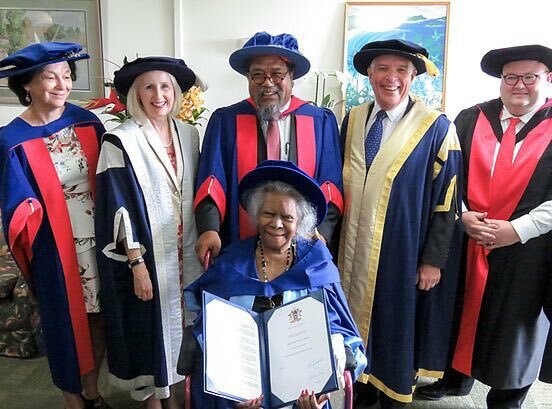 Only this month Bonita Mabo received one of James Cook University’s highest awards, an Honorary Doctor of Letters, in recognition of her outstanding contribution of 45 years of service to the community and her advocacy for Indigenous Australians and Australian South Sea Islanders.